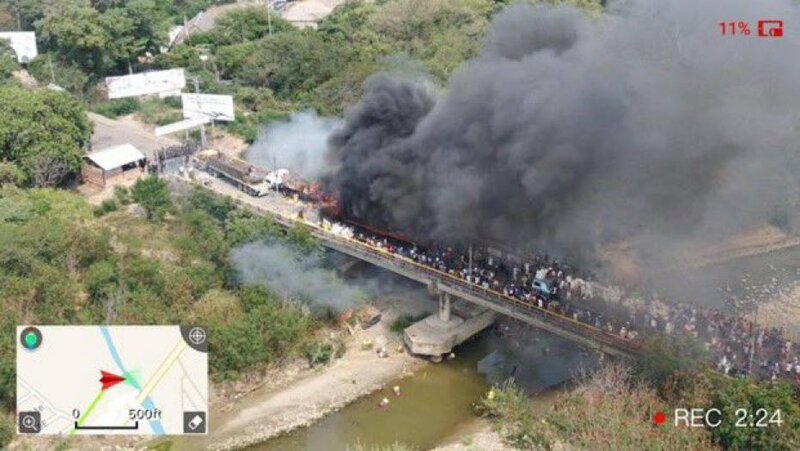 285 injured, 255 of whom are Venezuelans. 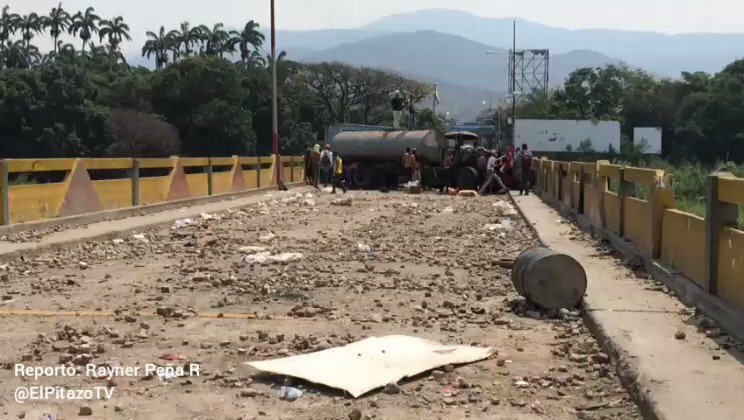 37 are hospitalized. 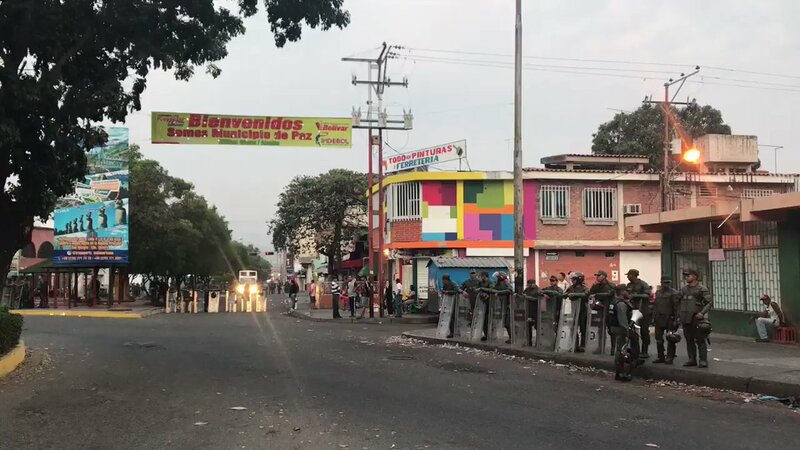 More than 60 soldiers have deserted, several of them officers who have requested refuge in Colombia. 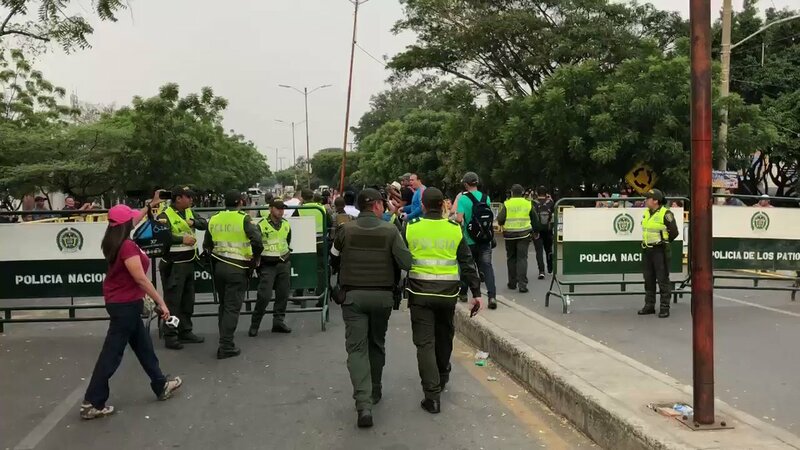 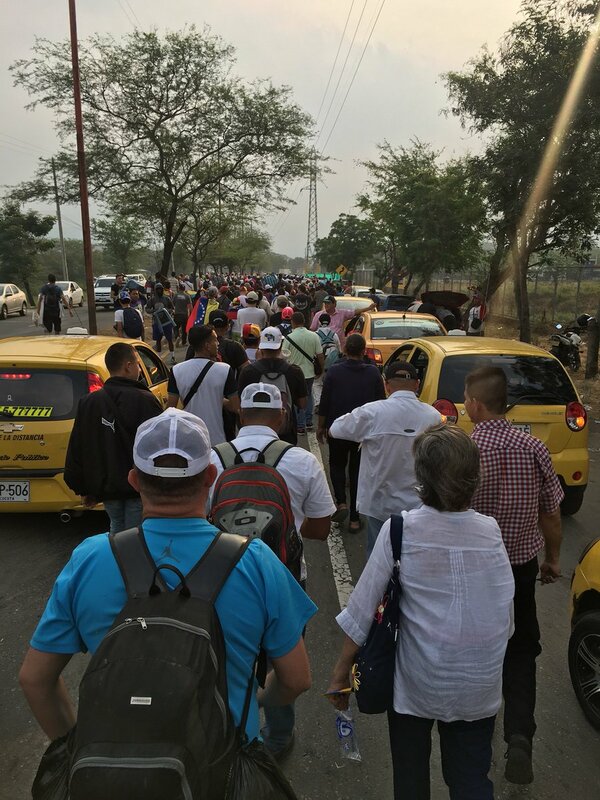 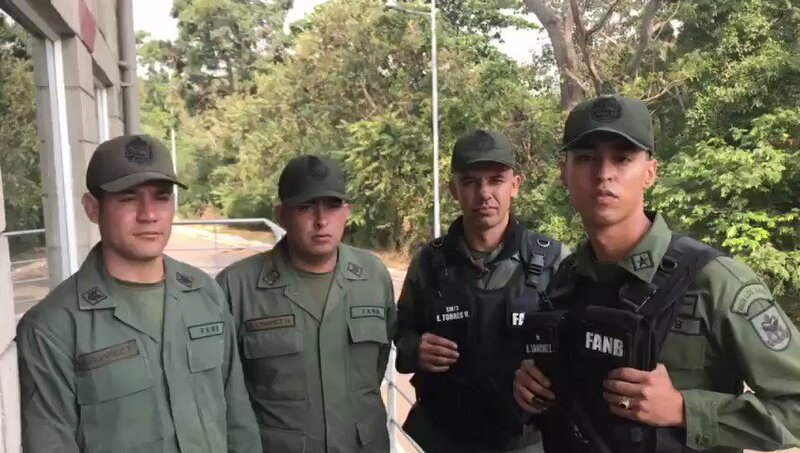 Colombian Migration informs that there are already more than 60 Venezuelan Armed Forces officials this 23rd February crossed the border to adhere to the Constitution. 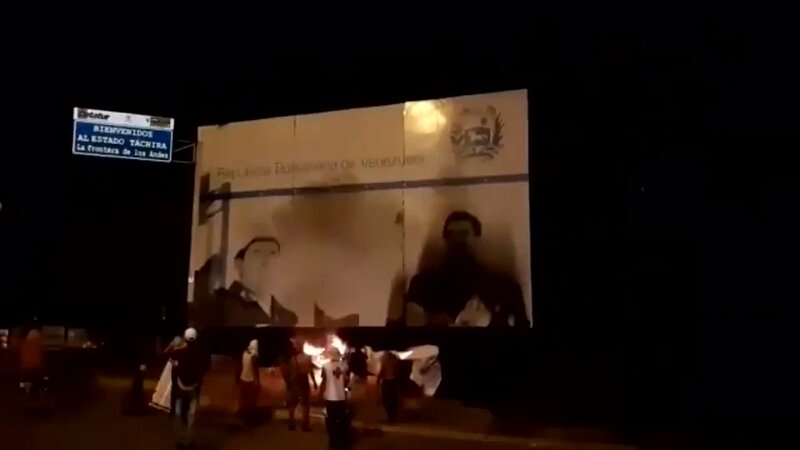 53 in Norte de Santander and 8 in Arauca. 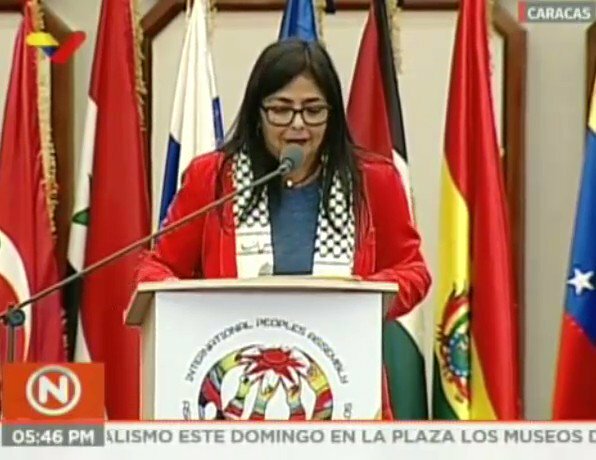 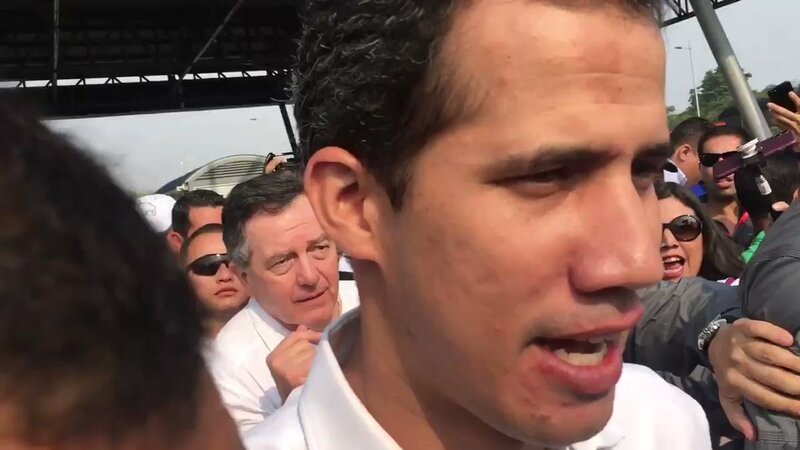 Juan Guaidó will speak in minutes. 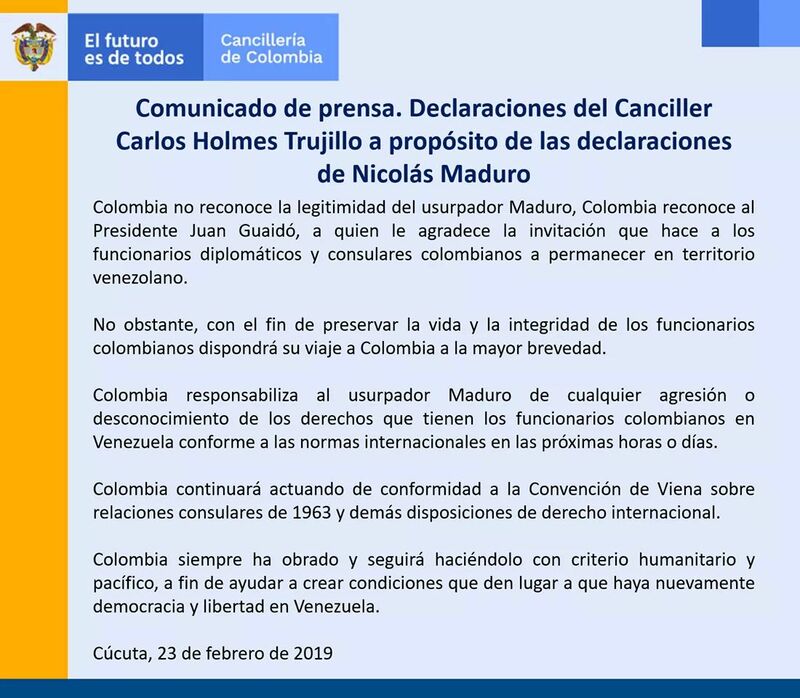 Statement: MFA Carlos Holmes Trujillo. 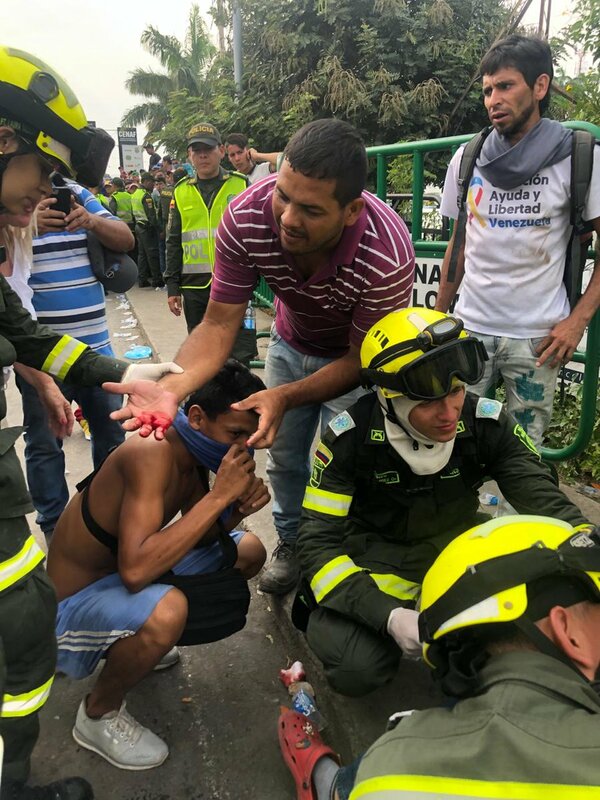 More injured on the Simón Bolívar bridge. 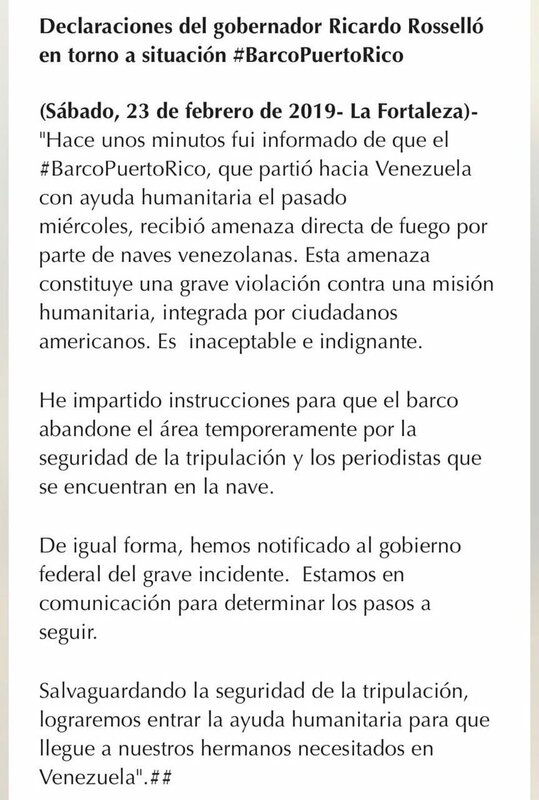 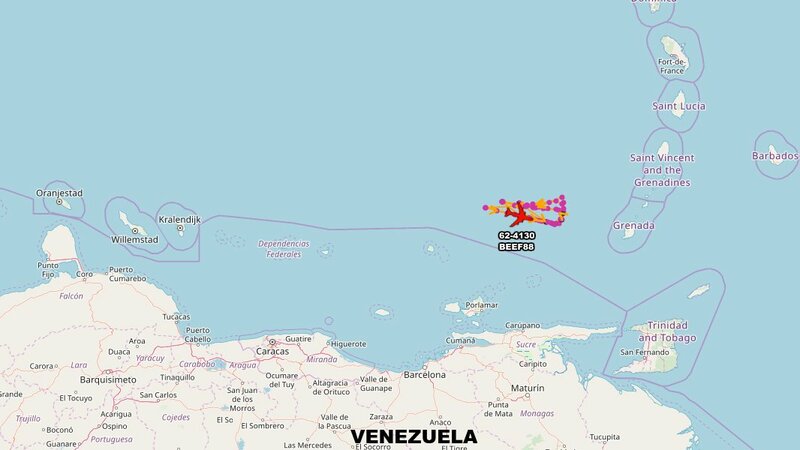 4:00 pm From the ship that left Puerto Rico with Humanitarian Aid: They inform that they already have in sight the vessels of the Venezuelan Navy. 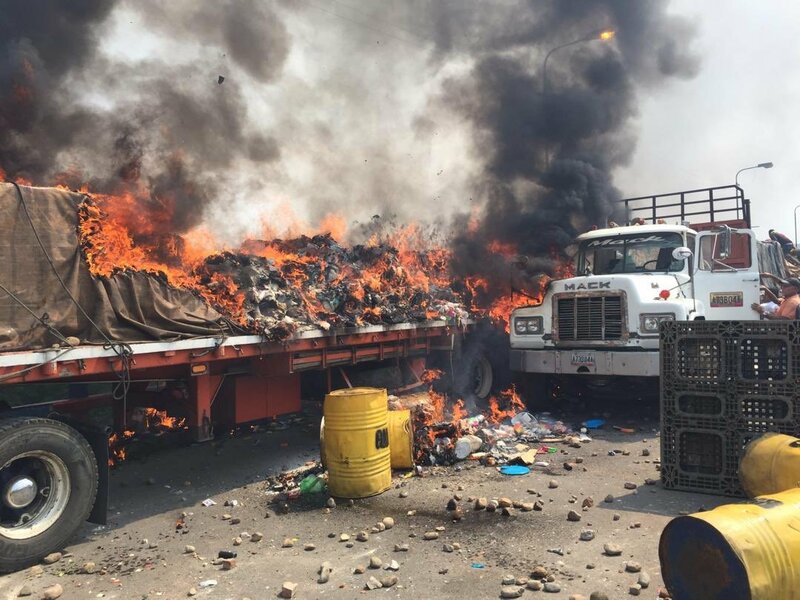 PNB set fire to trucks with Humanitarian Aid, People try to save the aid of the other 2 trucks on Francisco De Paula bridge Santander (Ureña). 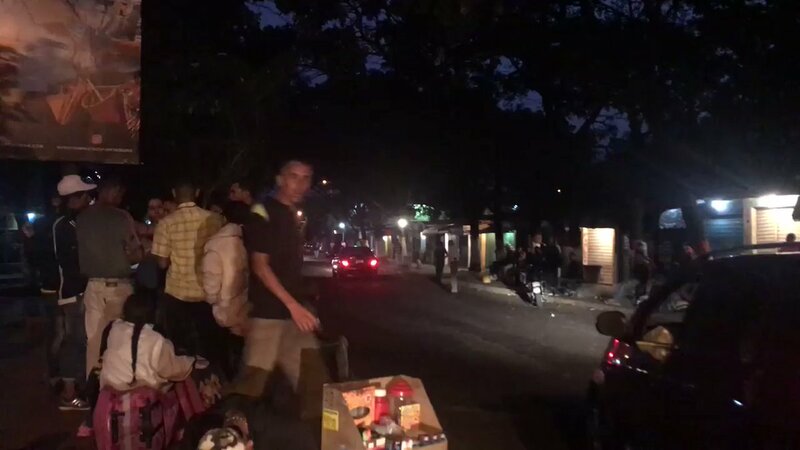 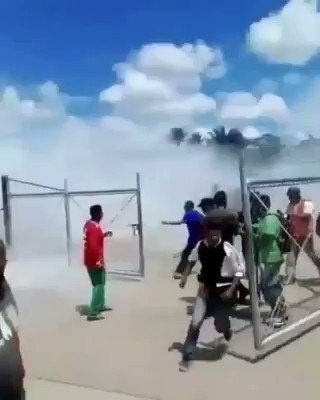 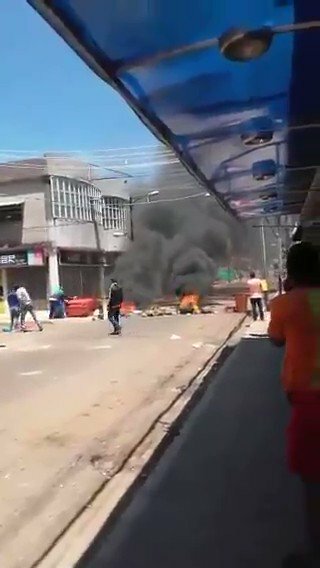 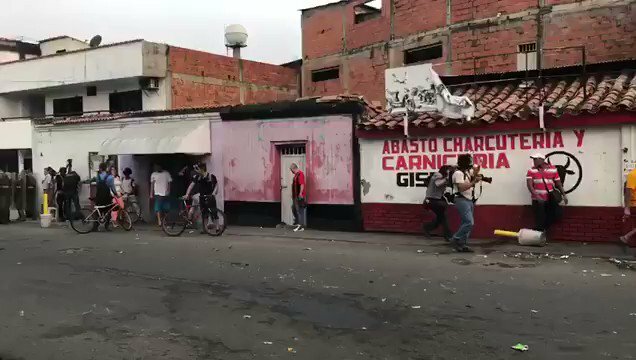 People, in human chain, try to save the food and medicines from humanitarian aid that are on the Venezuelan side, burned down by GNB troops. 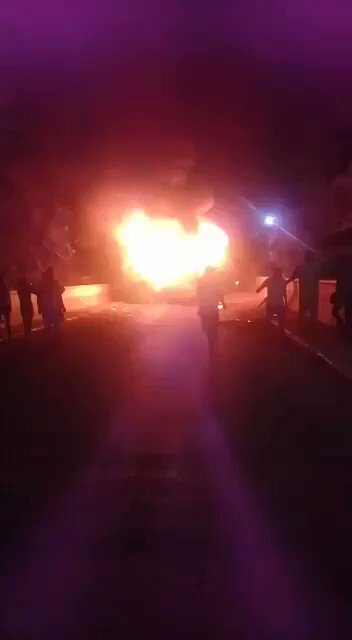 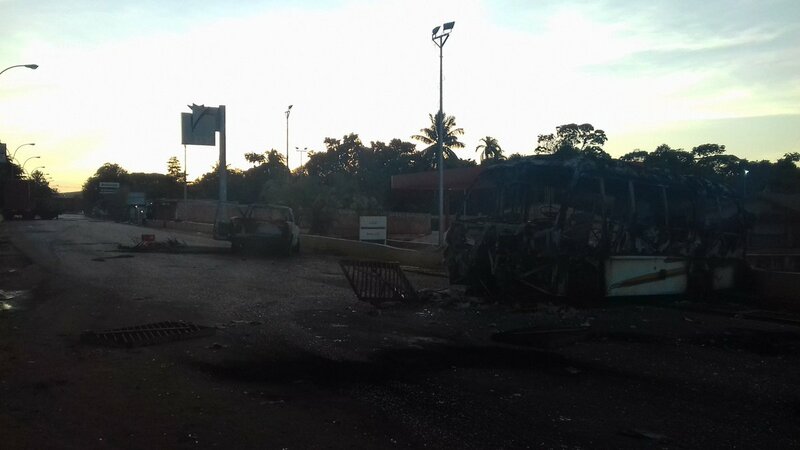 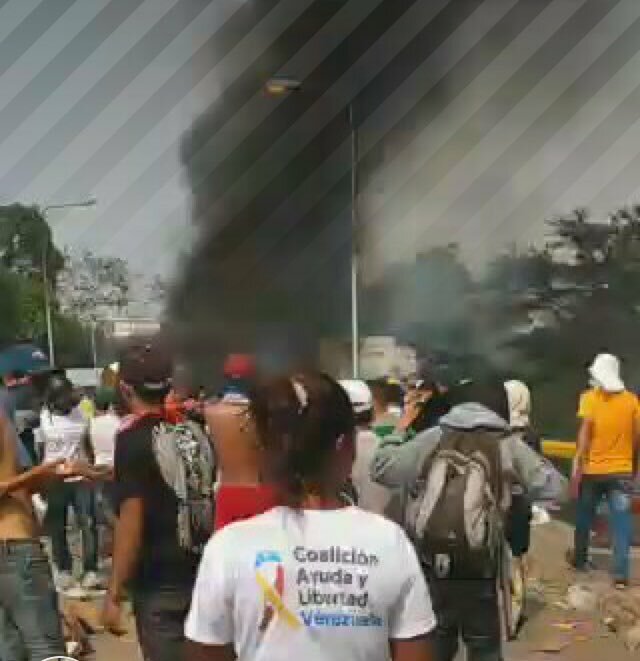 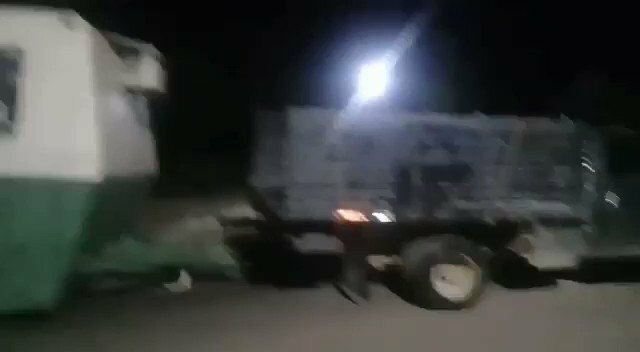 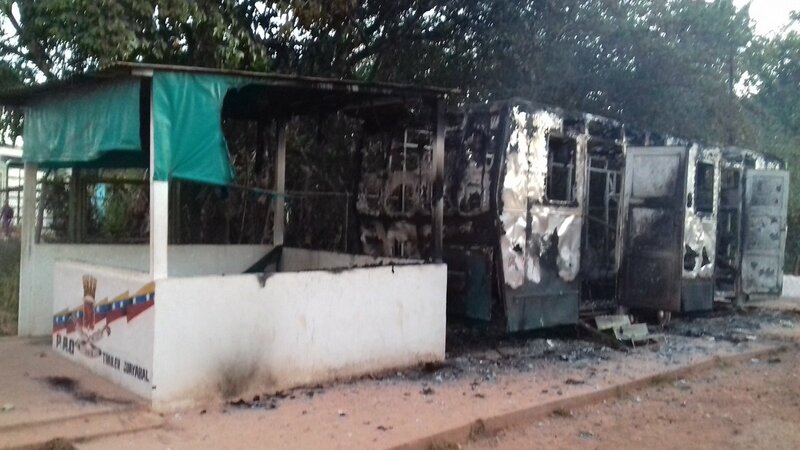 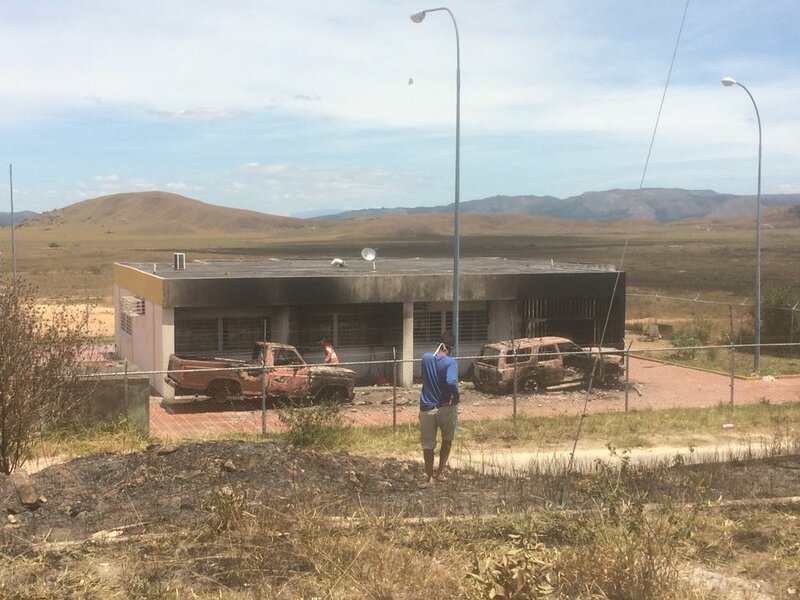 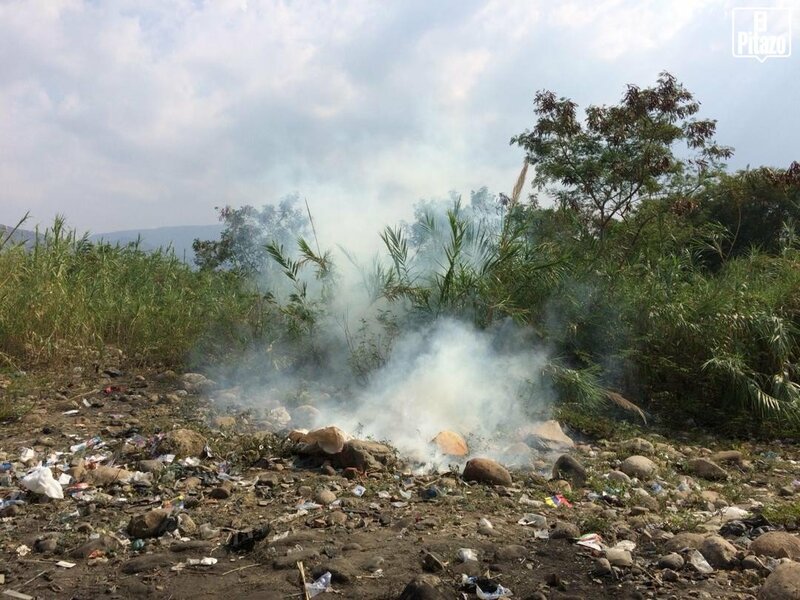 Collectives have just burned a truck with humanitarian aid on the border of Táchira. 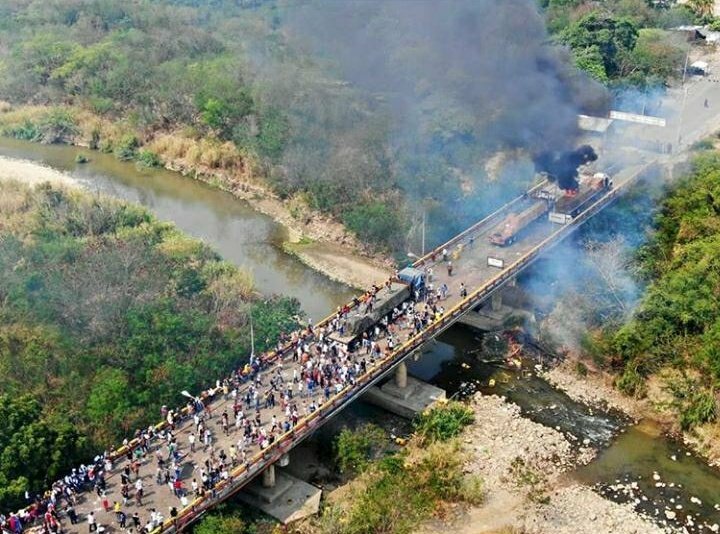 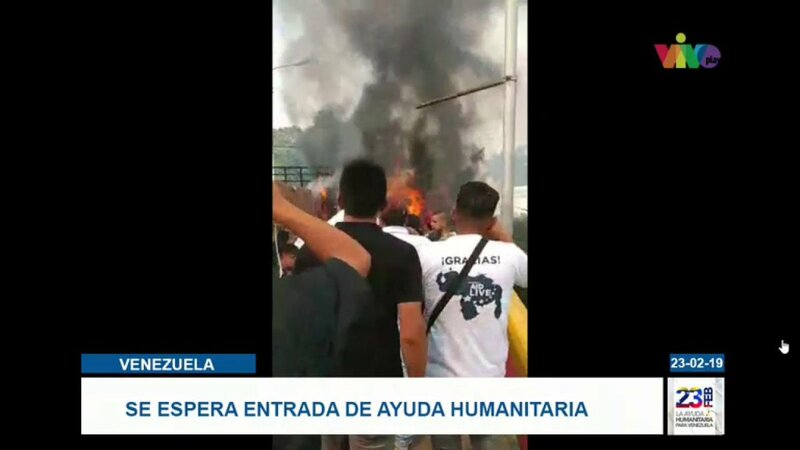 Three trucks with humanitarian aid were burned by Maduro officials on a bridge, bordering Colombia. 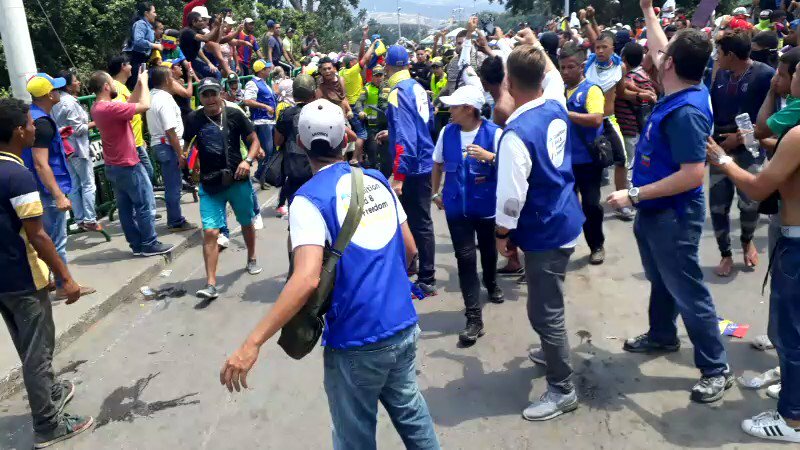 Strong repression of volunteers. 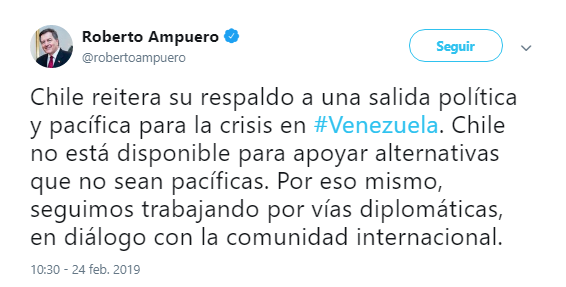 Maduro, Kolombiya ile olan tüm diplomatik ilişkilerini kestiğini ve tüm Kolombiyalı diplomatlara ülkeden ayrılmaları için sadece 24 saat verdiğini açıkladı. 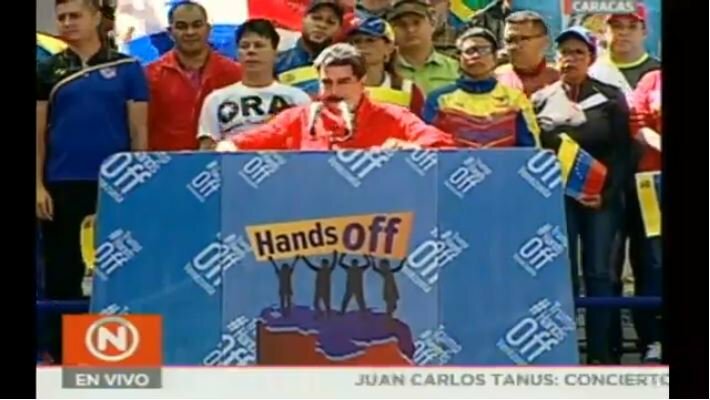 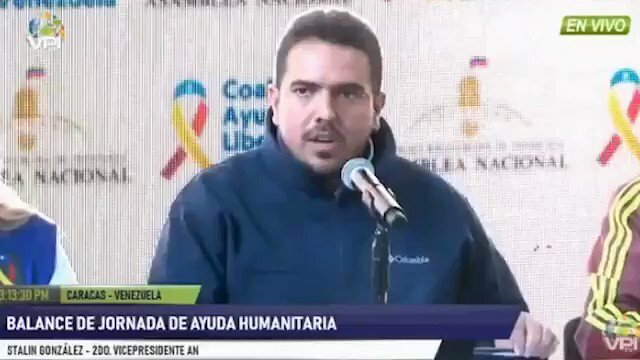 Maduro to Iván Duque: You are a devil in person and you will dry up to get involved with Venezuela. 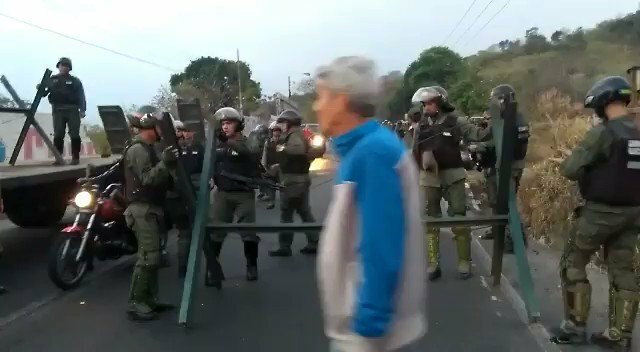 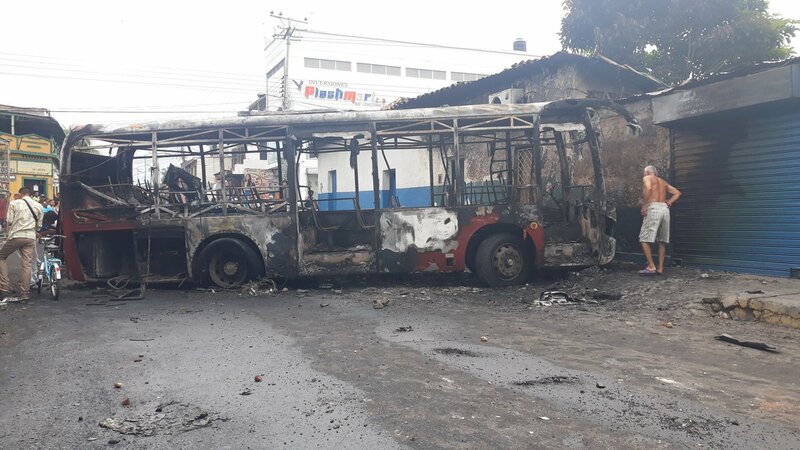 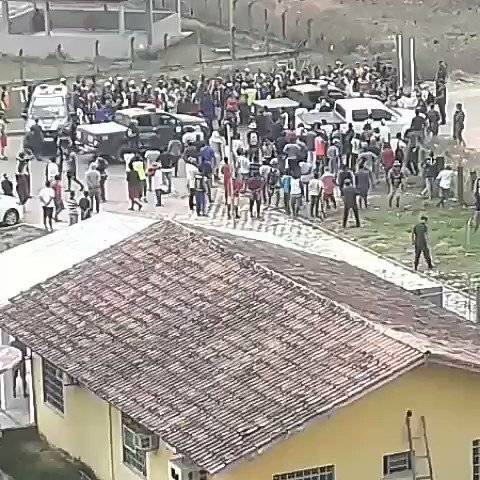 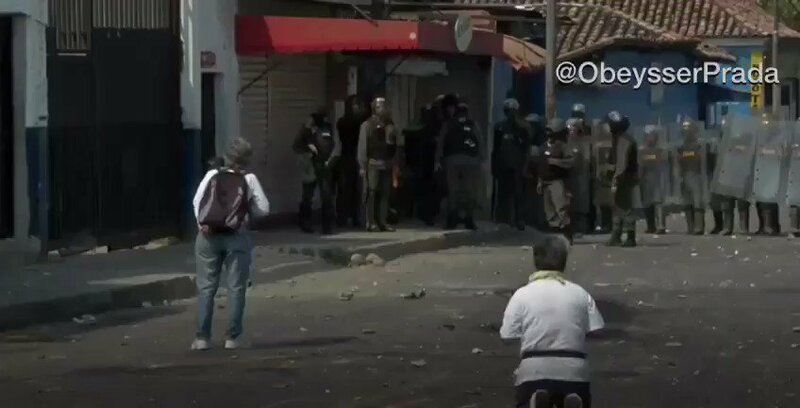 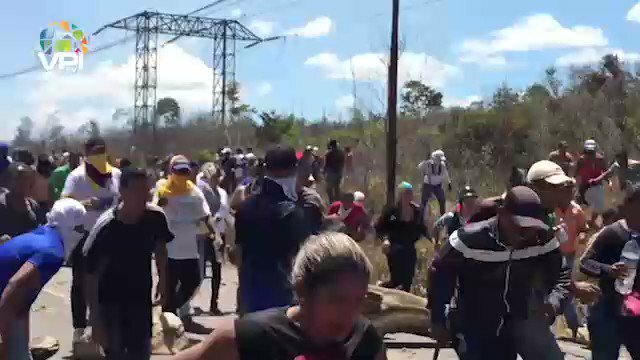 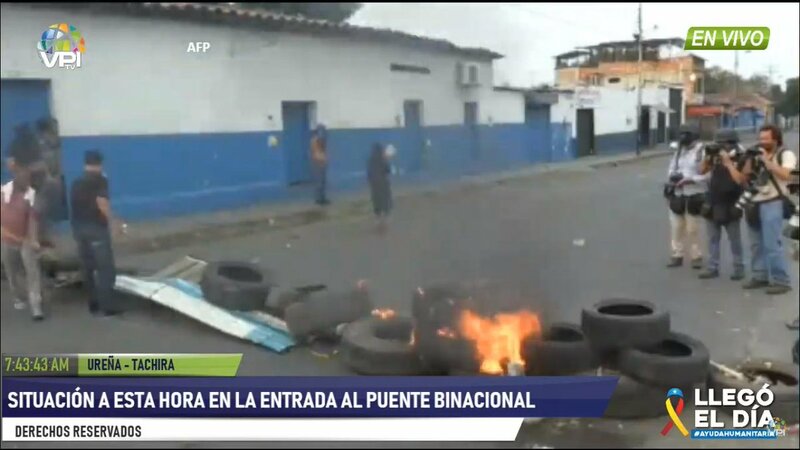 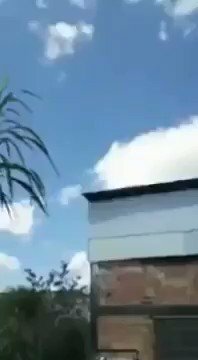 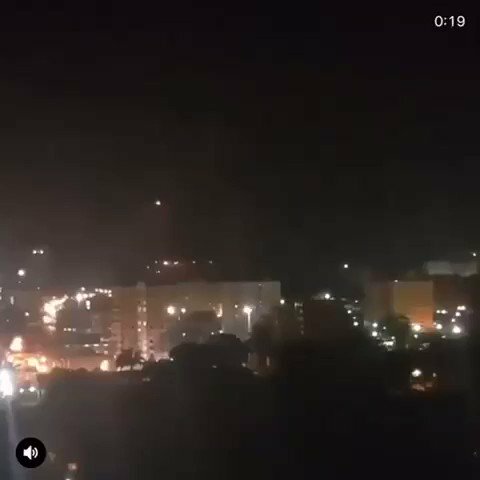 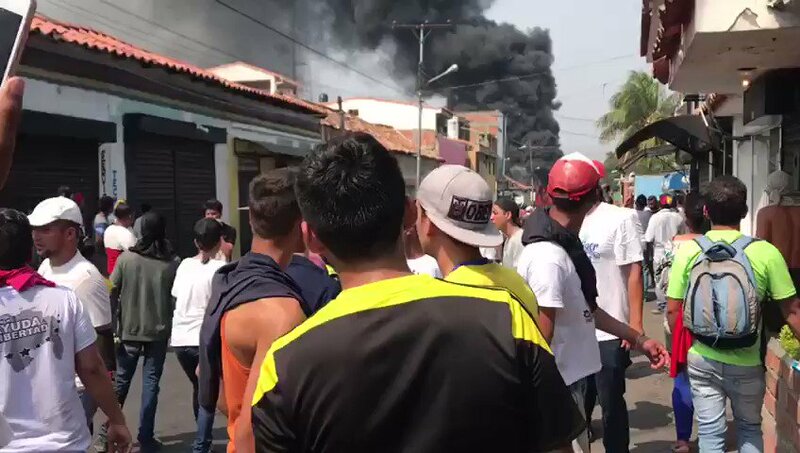 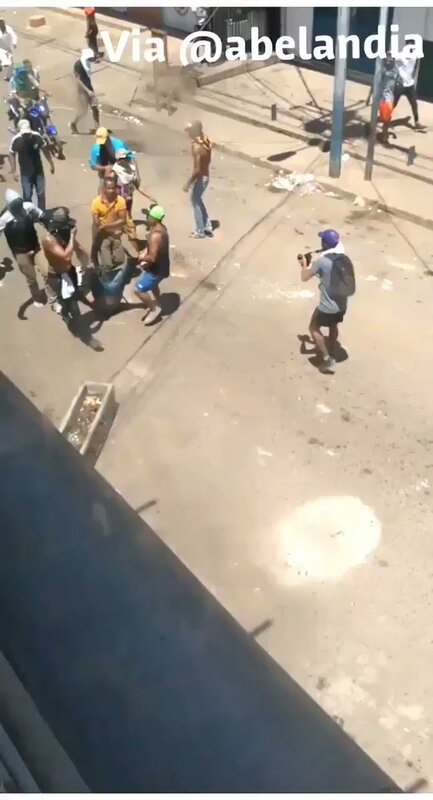 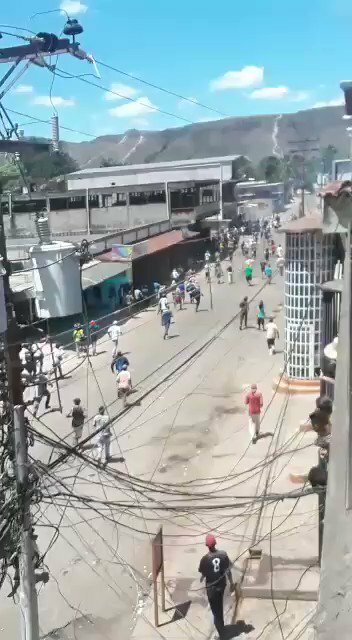 Clashes continue in Ureña, Táchira state, near the border with Colombia, between demonstrators and state security forces. 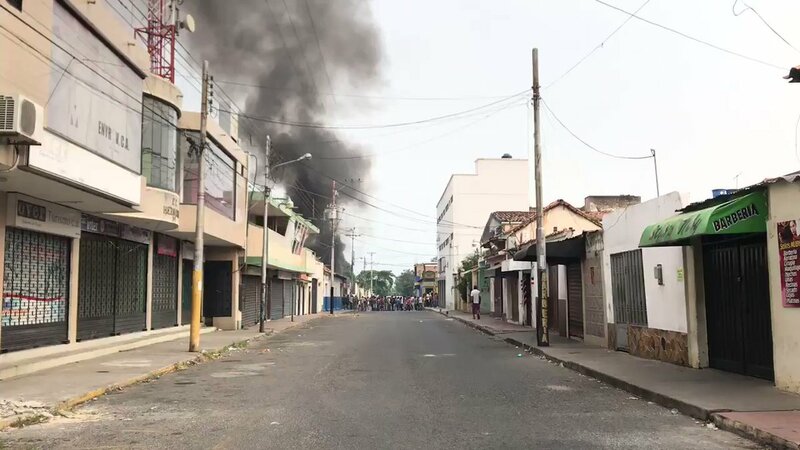 Acting President @jguaido: They are massacring people in Santa Elena de Uairén, on the border with Brazil. 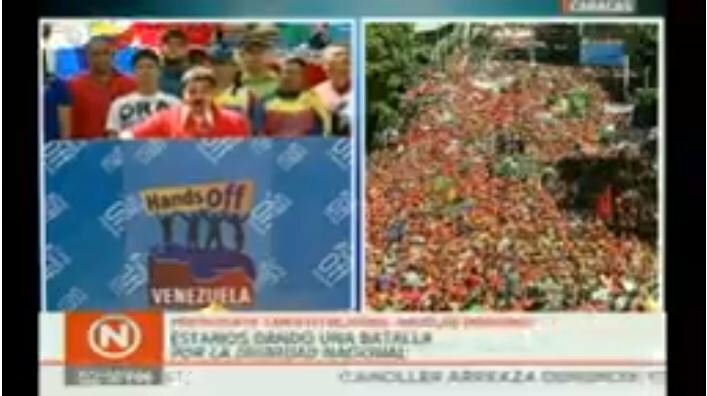 Maduro: With a concert they intend to wash Donald Trump's face. 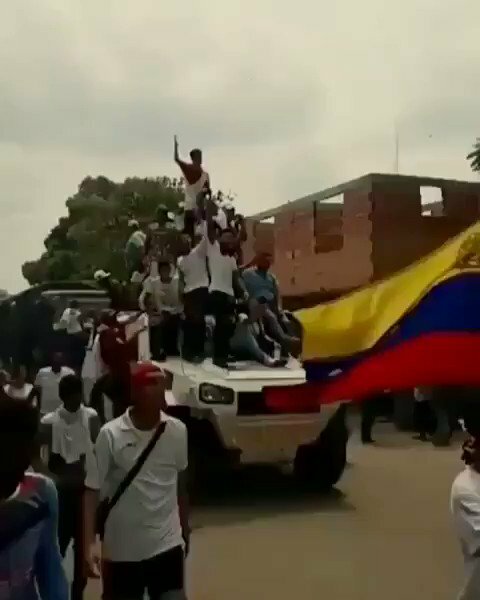 Traitors to the country who will sing to Trump. 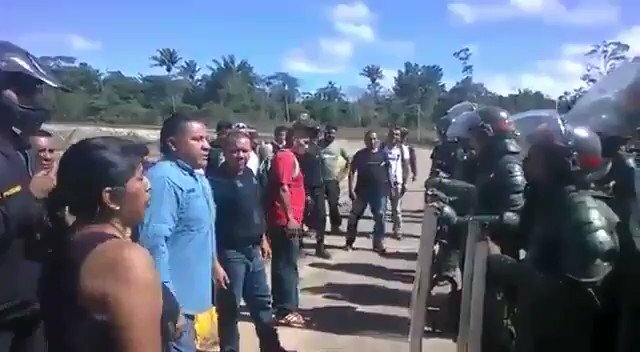 José Hernández, 26 years old, died from bullet wounds he received in Cuatro Esquinas, in Santa Elena de Uairén, Gran Sabana. 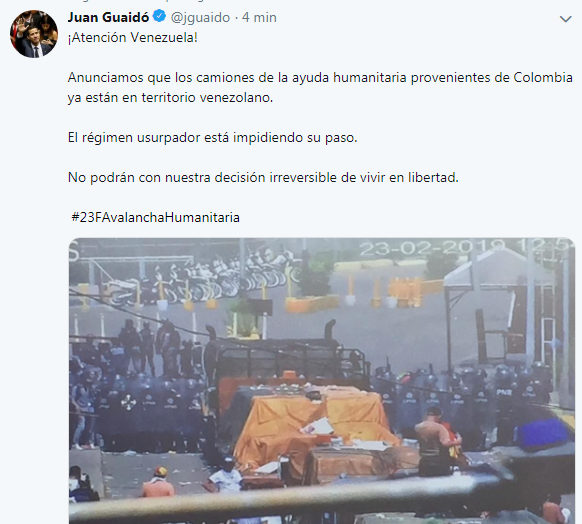 @jguaido: Attention Venezuela. 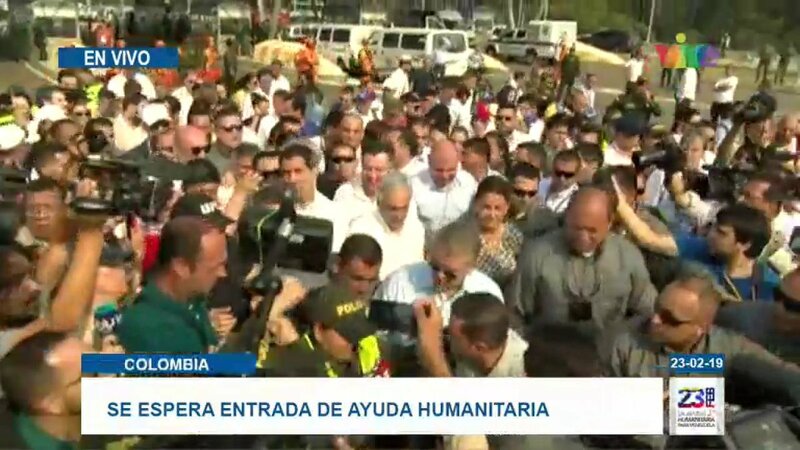 We announce that the humanitarian aid trucks coming from Colombia are already in Venezuelan territory. 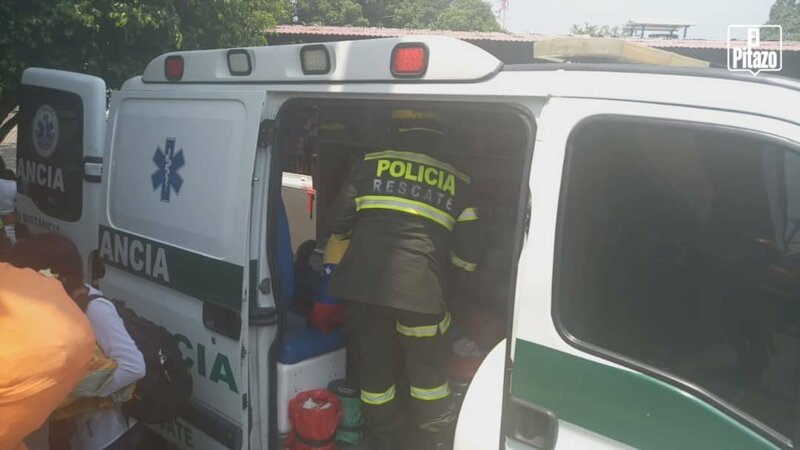 At least 12 gunshot wounded arrive at the Hospital Rosario Vera Zurita, in Santa Elena de Uairén, Gran Sabana. 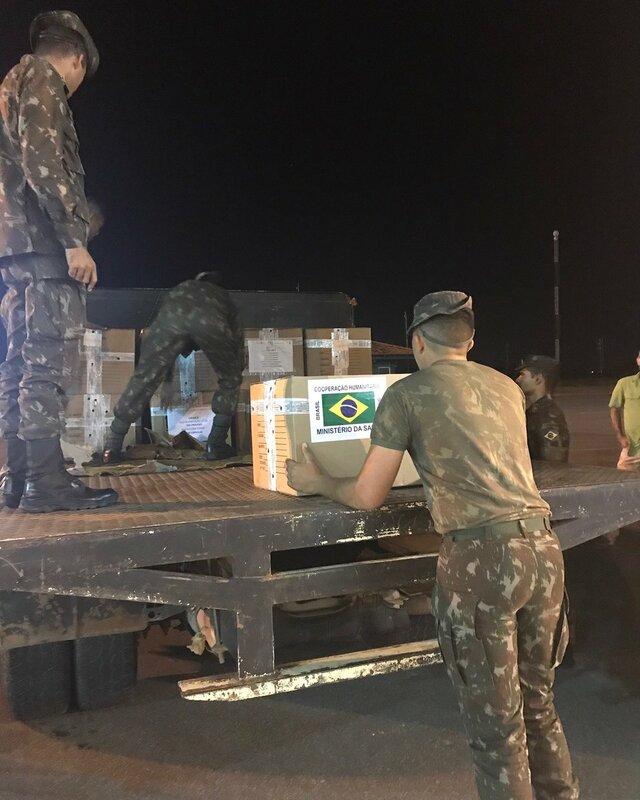 The wounded arrive from Fort Roraima, Escamoto, where the GNB prevented the passage to the border line. 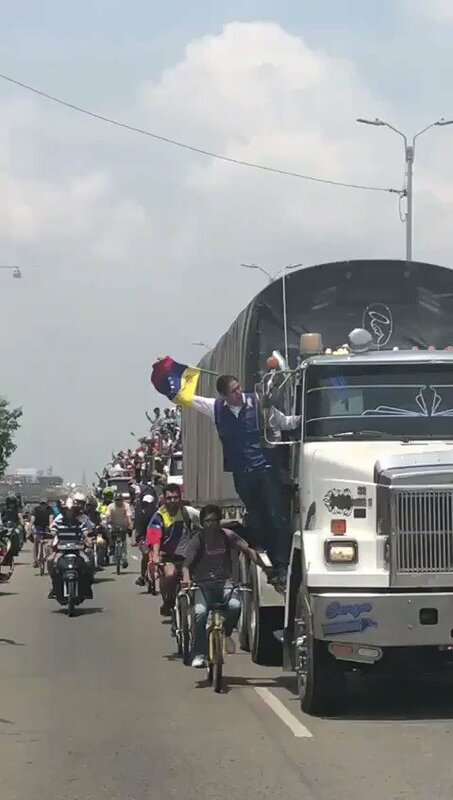 This is the Francisco Fajardo Highway. 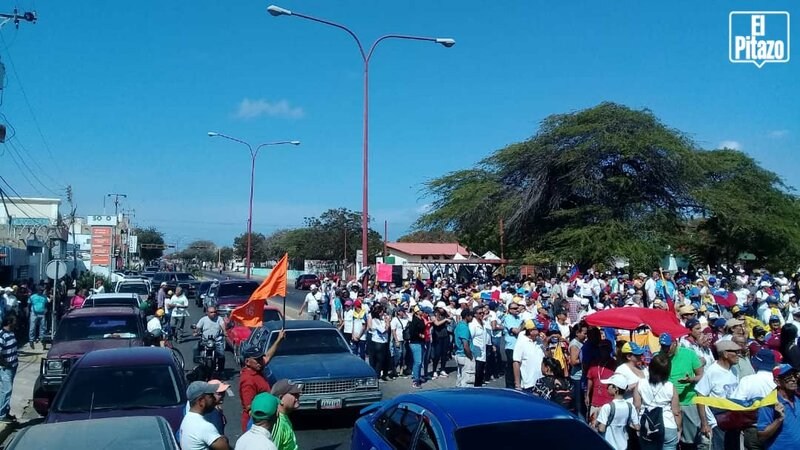 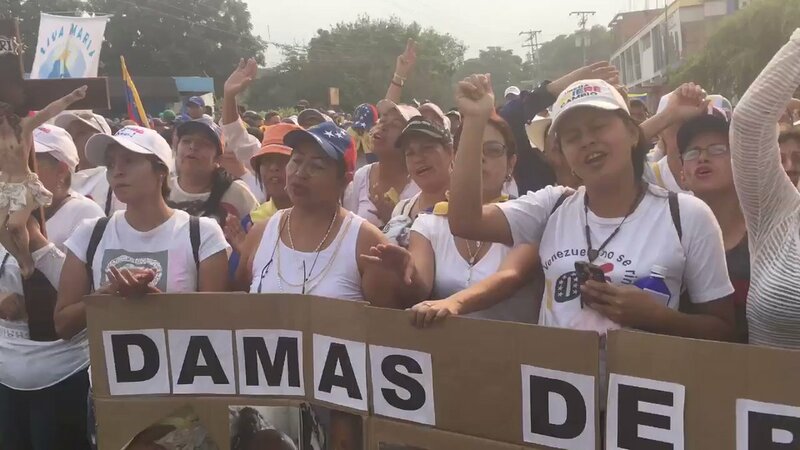 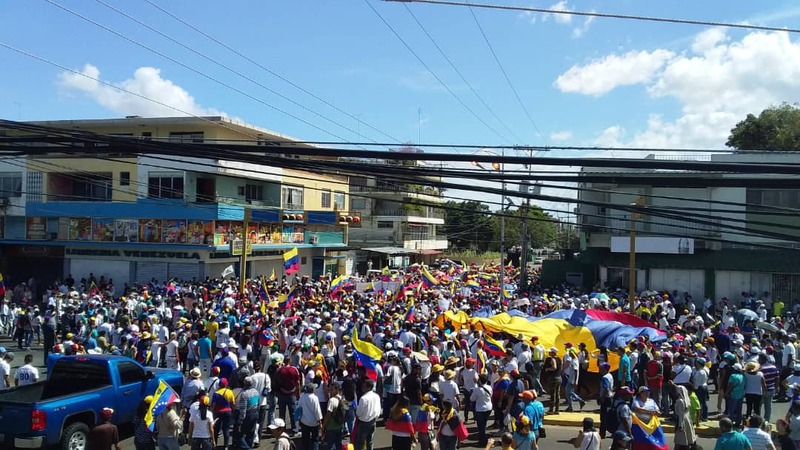 Citizens surround La Carlota Air Base to demand the entry of humanitarian aid. 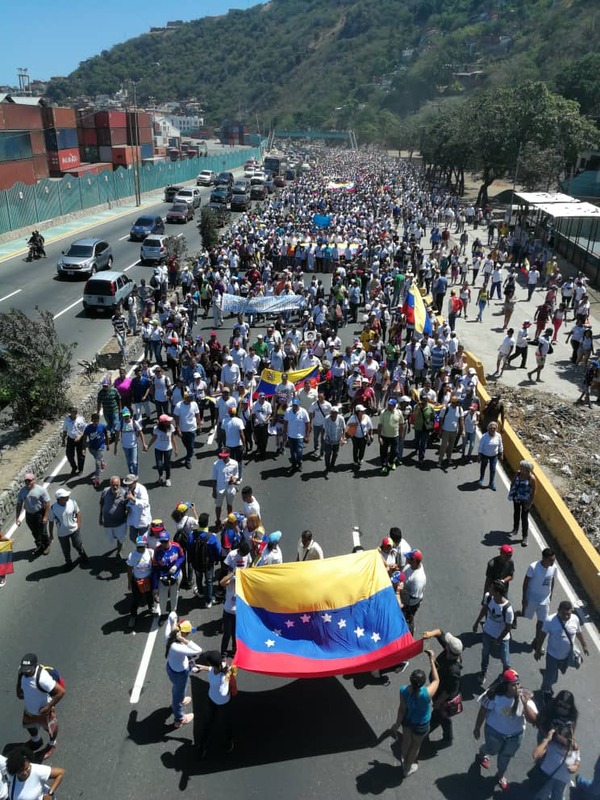 Deputy @LesterToledo: Come on, Venezuela. 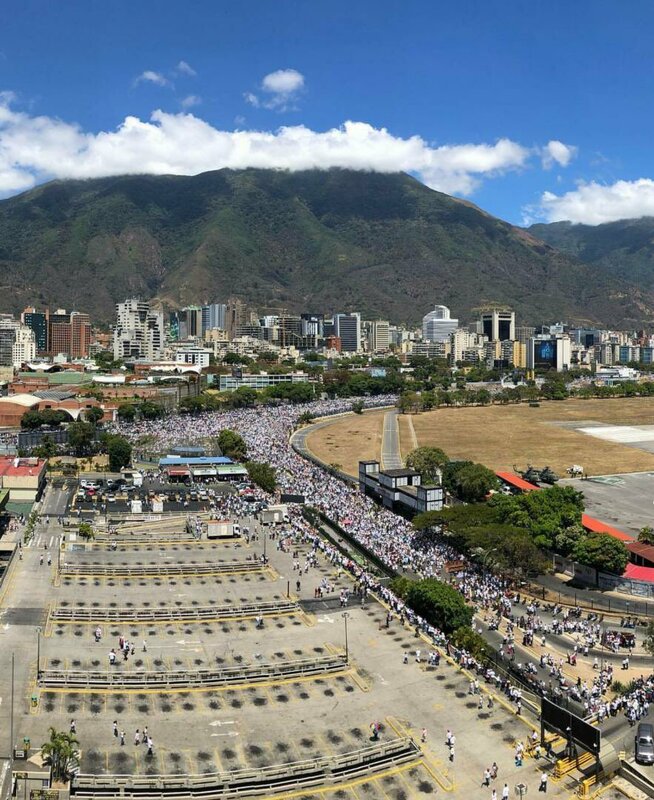 Today we are making history. 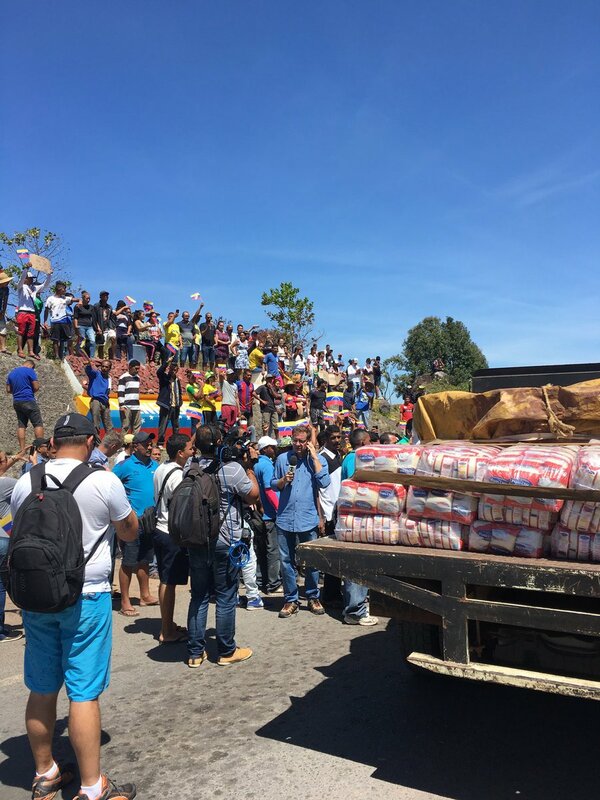 We carry an avalanche of humanitarian aid for our people. 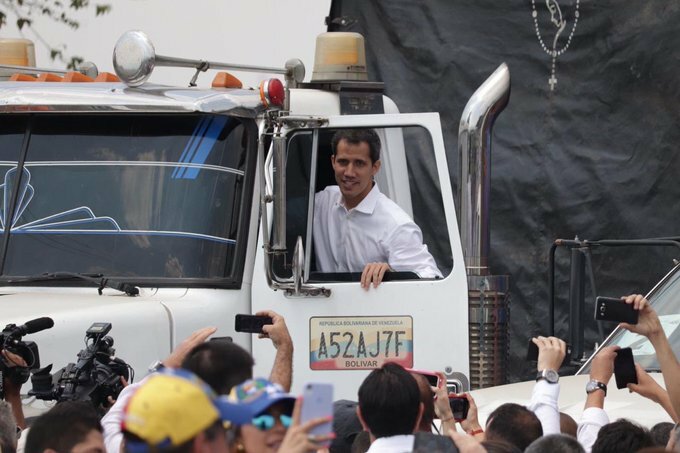 We will make it possible for these trucks to take the aid to Venezuelan territory. 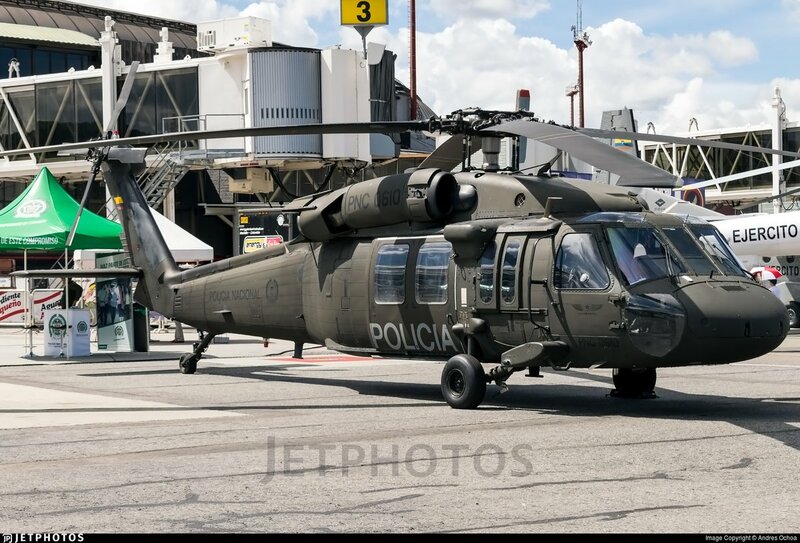 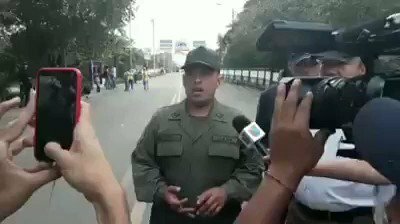 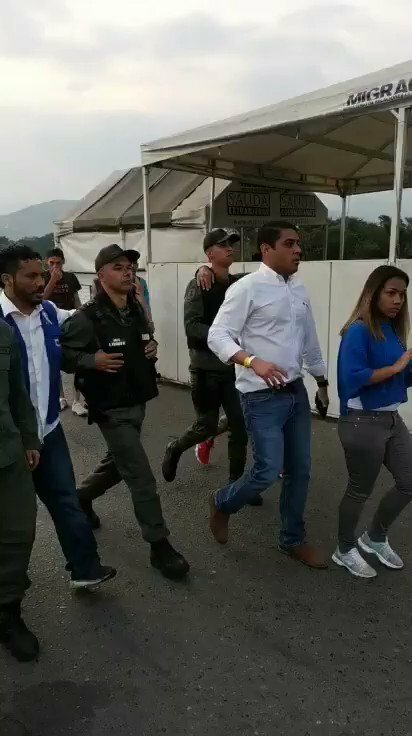 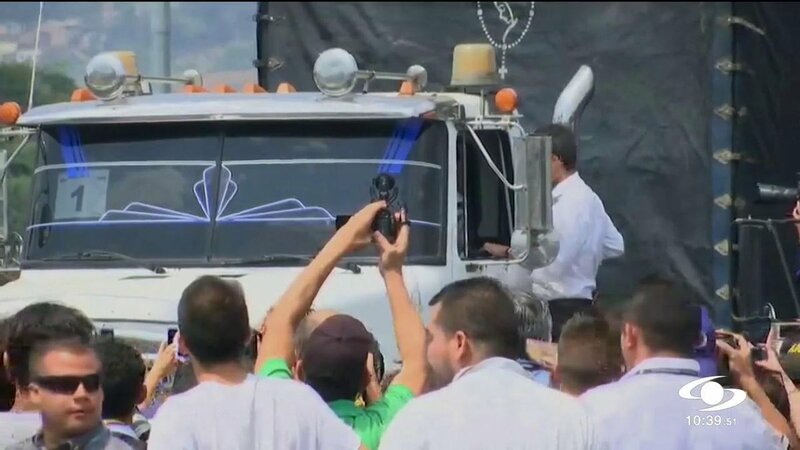 Officer of Special Forces of the Venezuelan National Police, arrives in Colombia and assures that "89% of his institution is in disagreement with the Maduro government"
The second 4 trucks leave for the Francisco de Paula Santander border bridge in Ureña accompanied by Venezuelan citizens who support the entry of humanitarian aid. 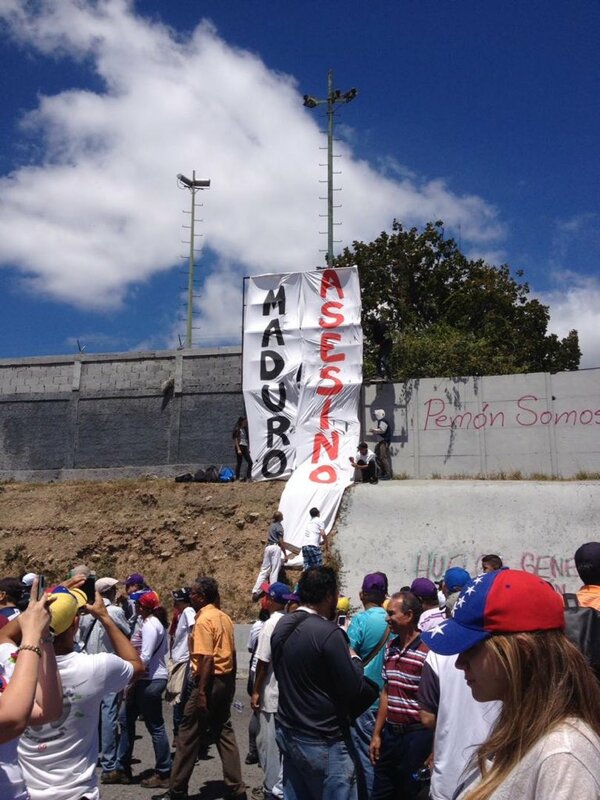 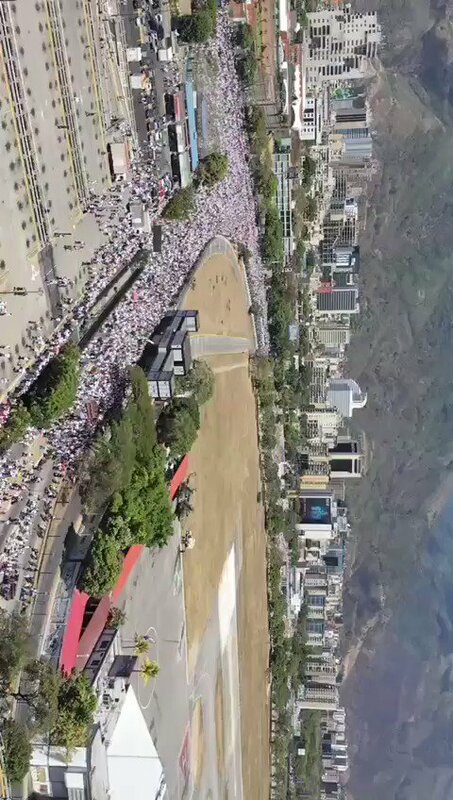 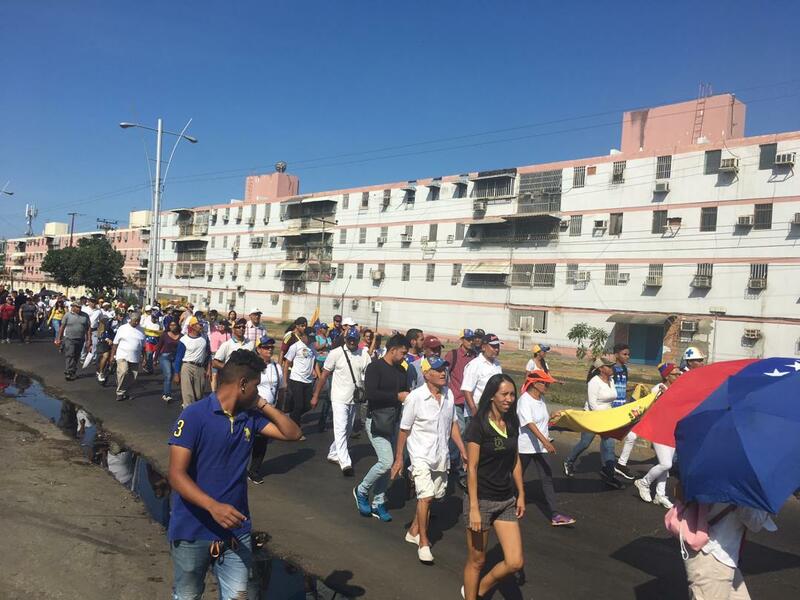 Rally at the Francisco Fajardo highway around the Francisco de Miranda Air Base "La Carlota" in Caracas. 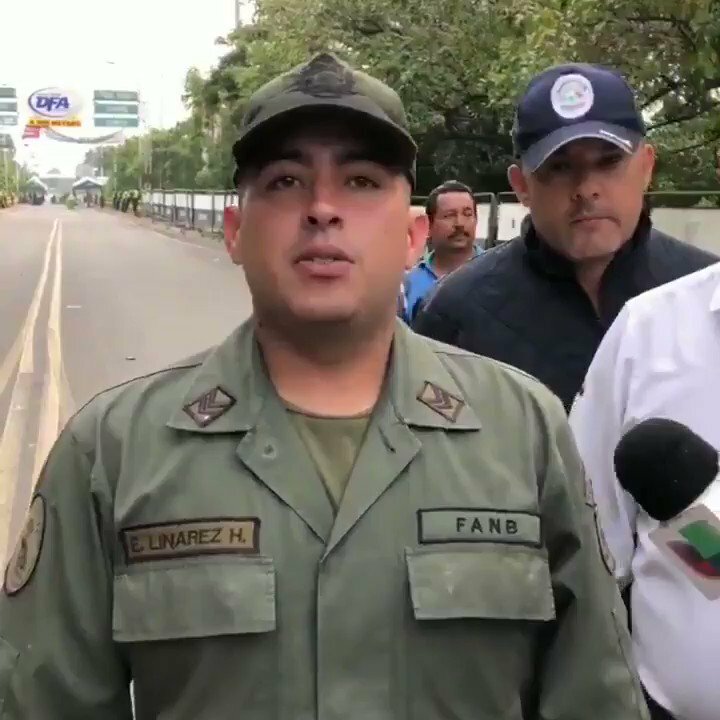 CNN reports that sources from the Government of Colombia confirmed that "the second in command of the GNB in Táchira has defected". 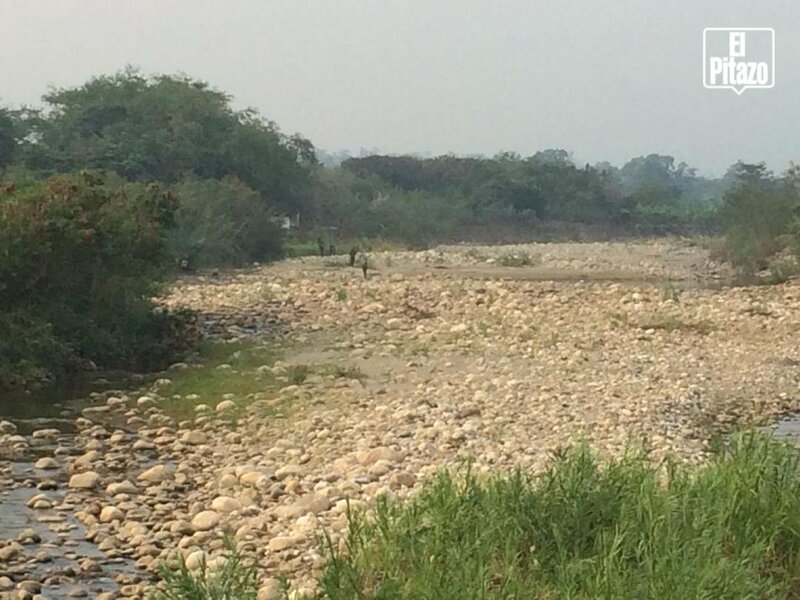 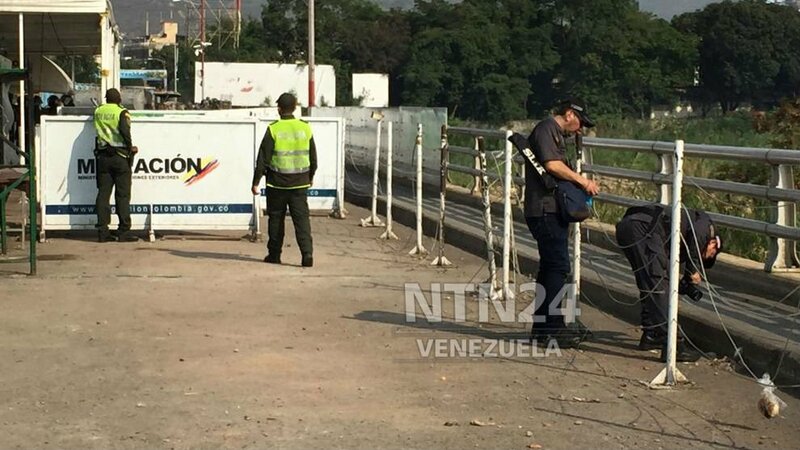 Cúcuta: Trucks with humanitarian assistance are advancing towards the border. 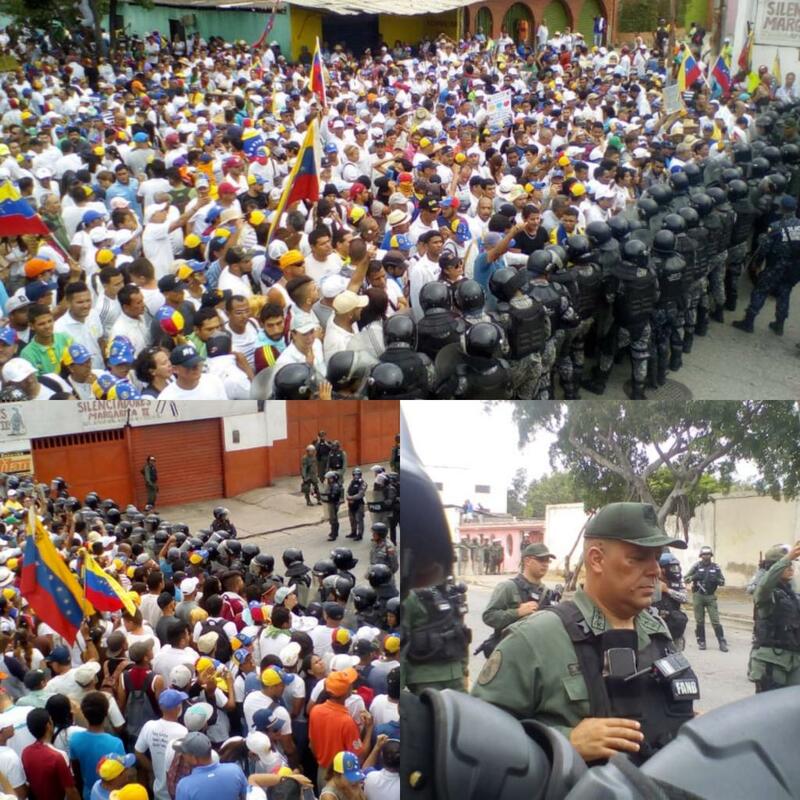 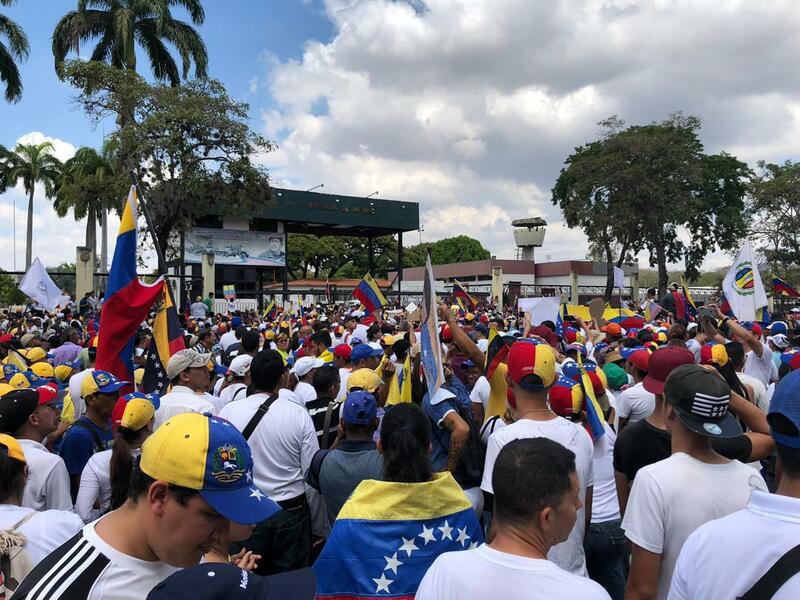 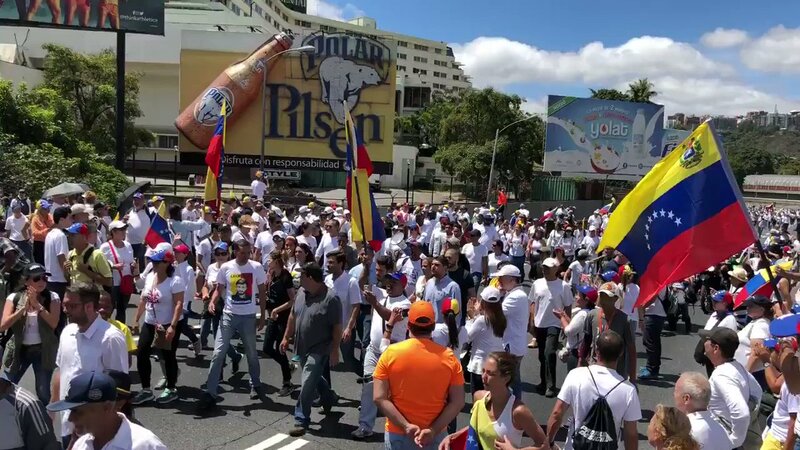 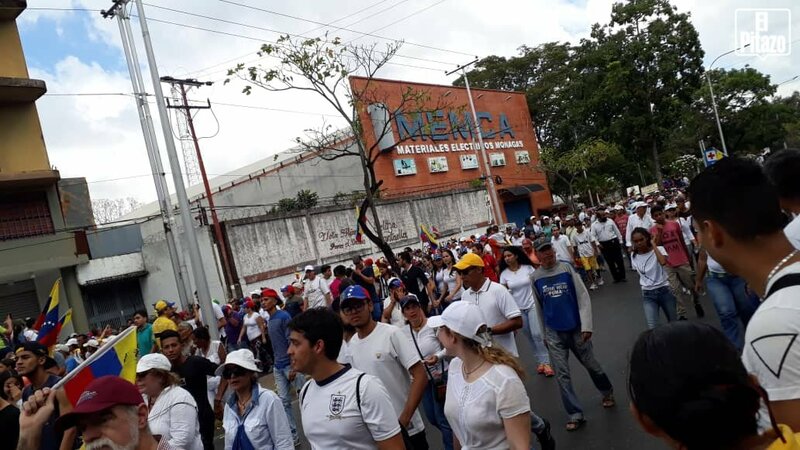 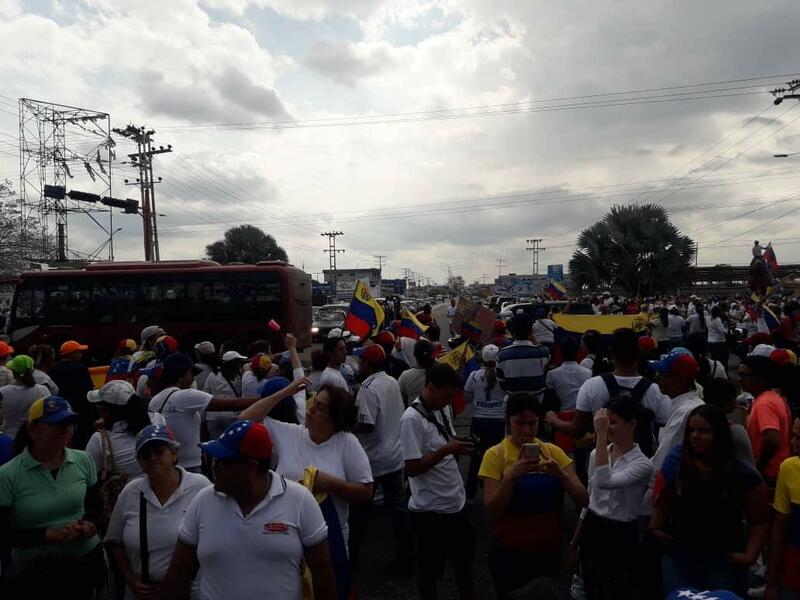 Civil society begins to concentrate in front of the Barquisimeto detachment in support of the entry of humanitarian aid to the country. 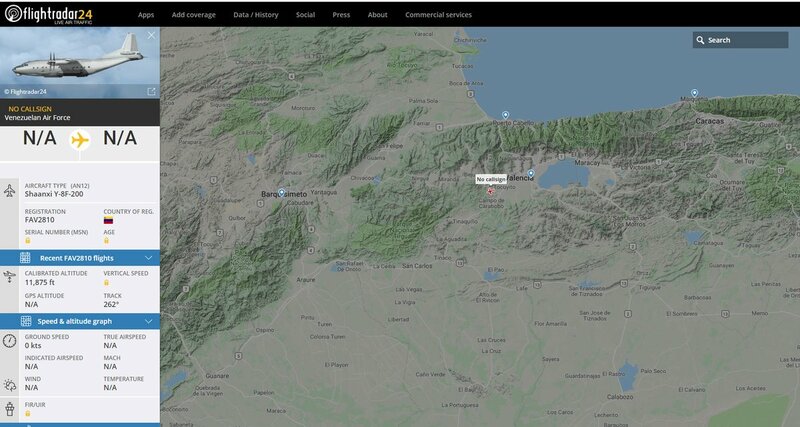 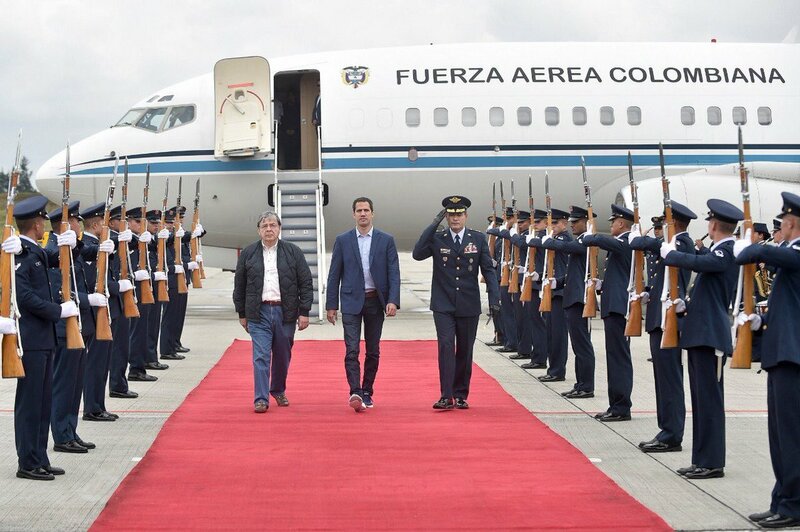 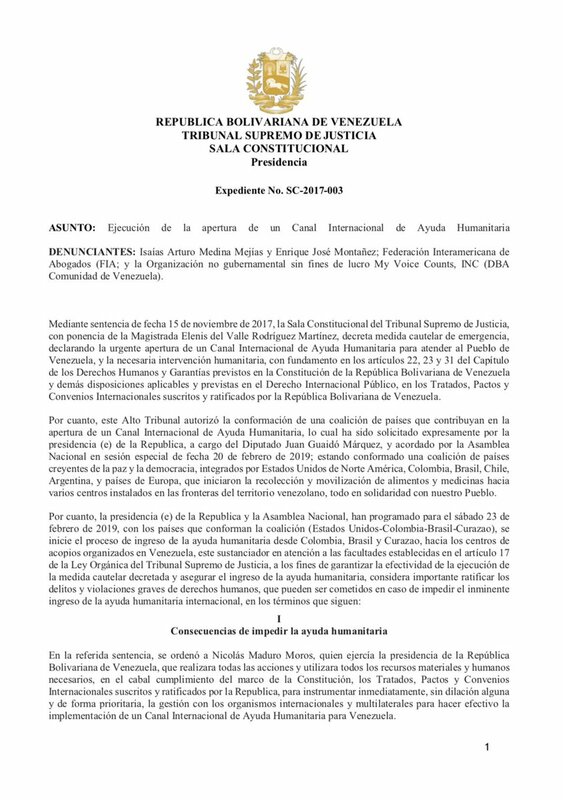 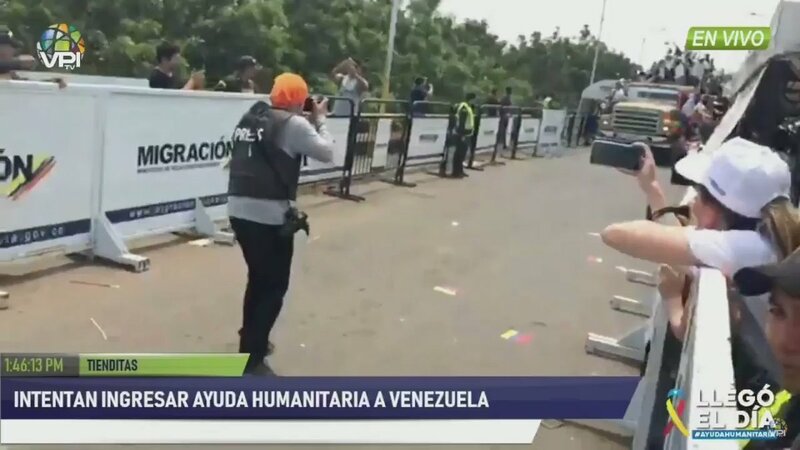 President Juan Guaidó begins the transfer of Humanitarian Aid to Venezuela. 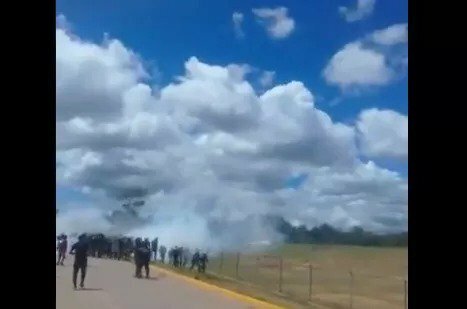 Guards surrenders to the Pemons who take back control of the Santa Elena de Uairén airport. 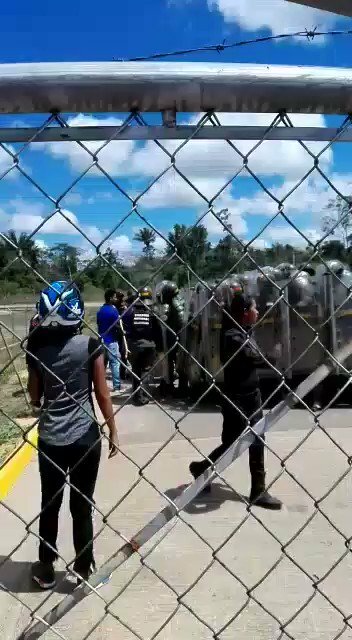 PEMONES take control. 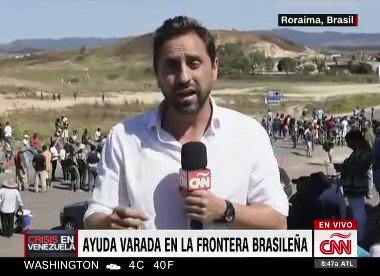 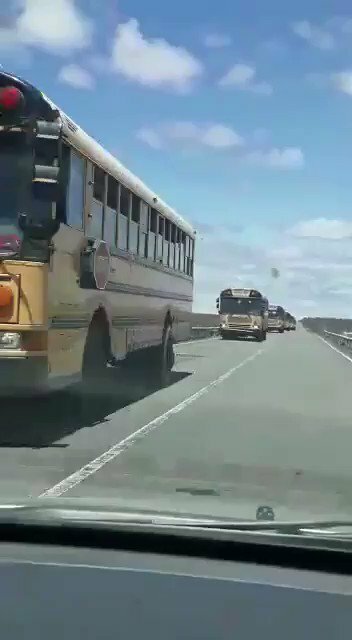 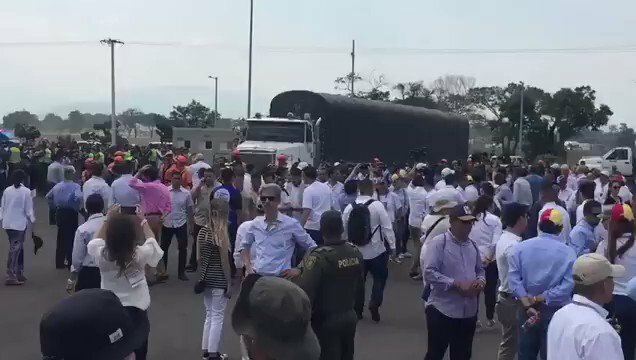 Caravan of trucks with AyudaHumanitaria leave for the border area with Venezuela. 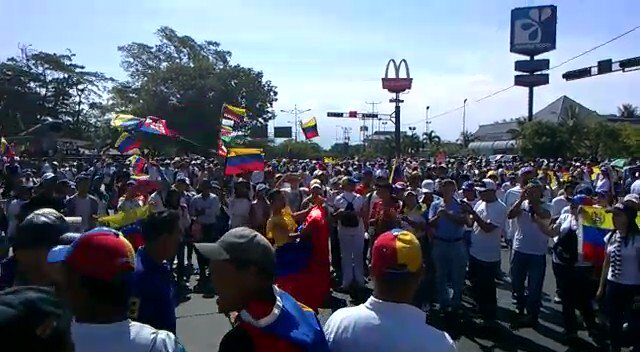 Rally in Altamira. 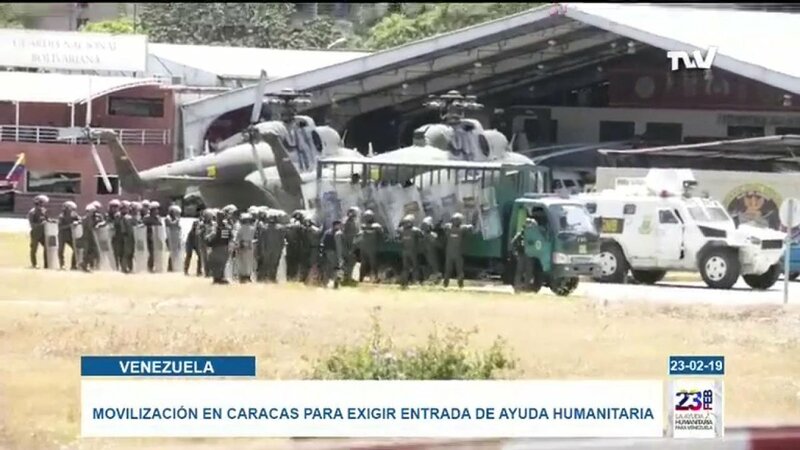 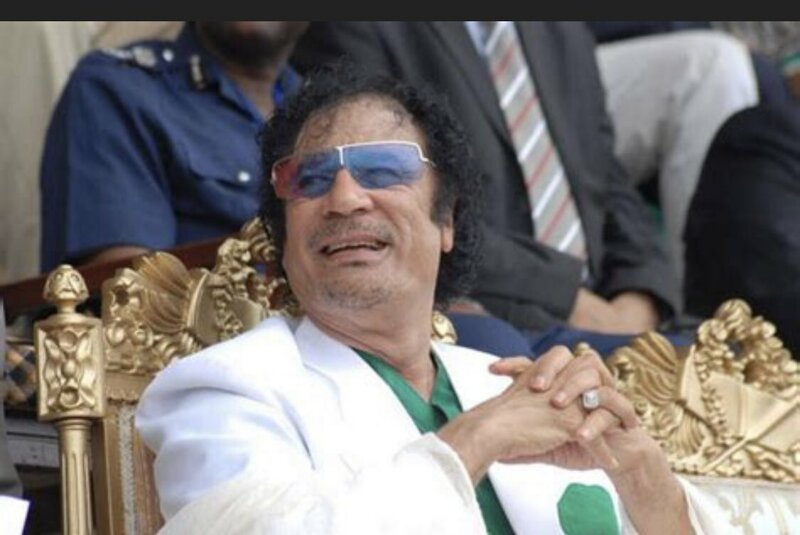 Citizens will go to military garrisons today to press for humanitarian aid. 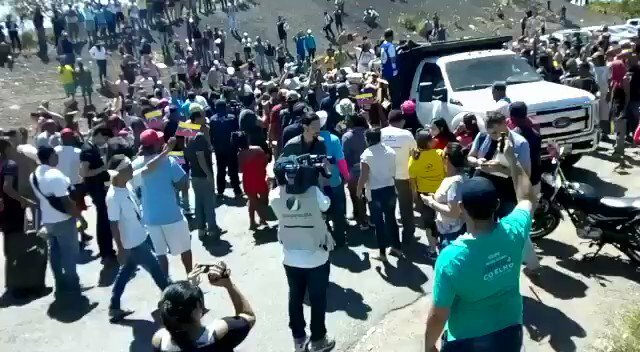 @jguaido: "Anyone who is not on the side of the people and who prevents the entry of humanitarian aid is a deserter who betrays our people, who accompany us to save the lives of Venezuelans are true patriots." 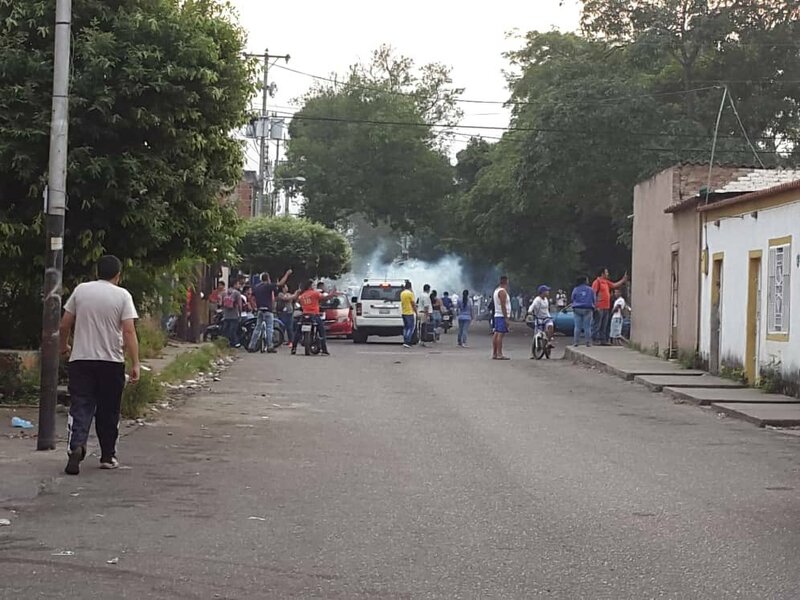 Again confrontations between Pemones and GN, after the mayor asked the military not to attack them again. 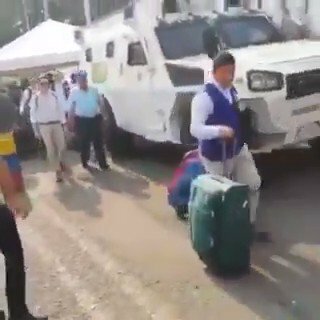 They request the entry of humanitarian aid. 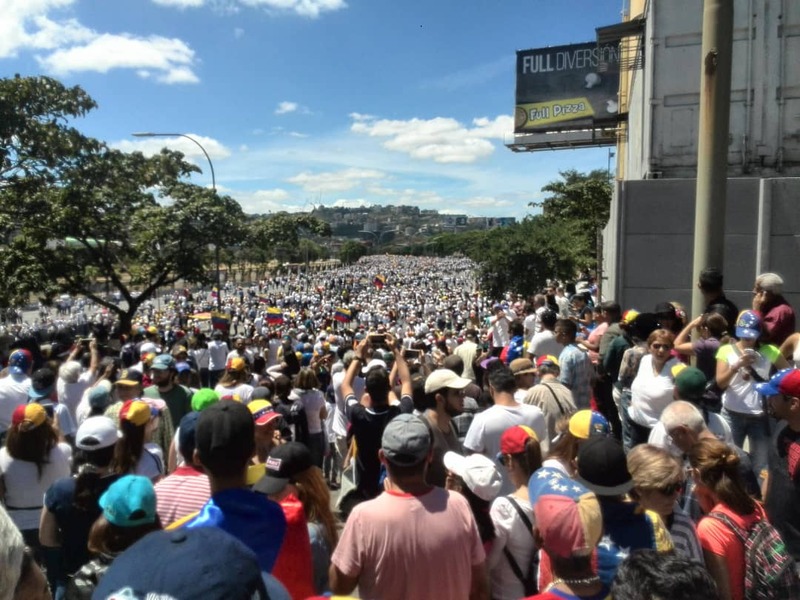 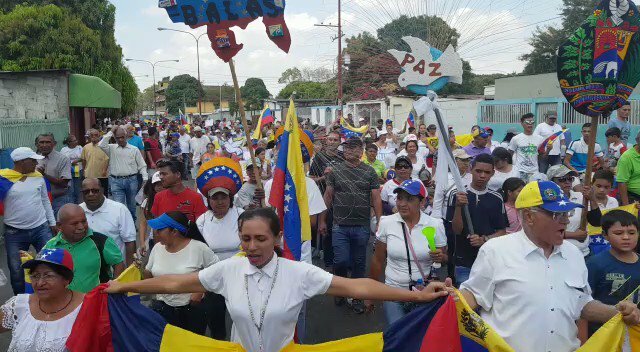 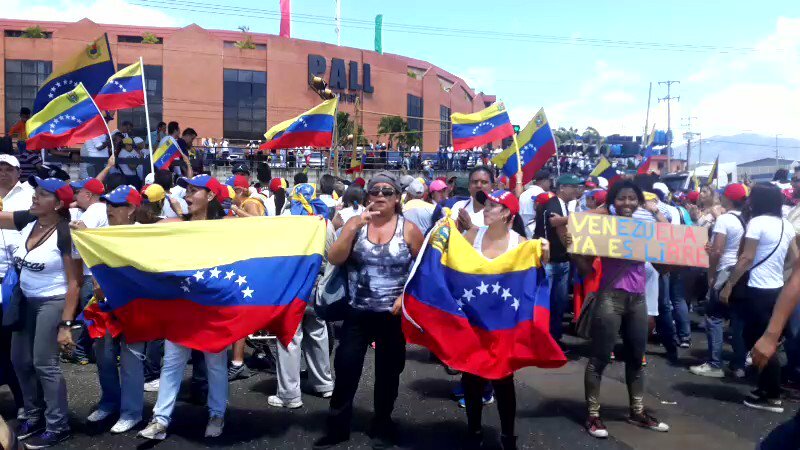 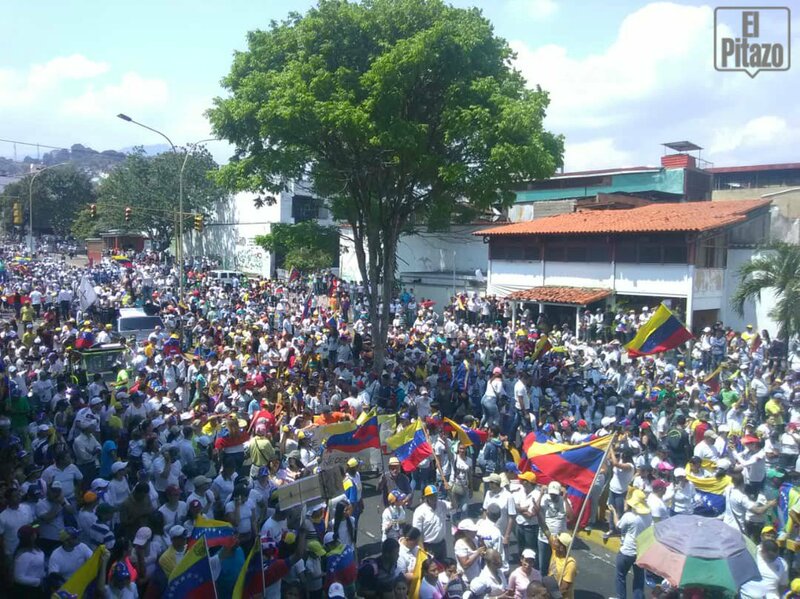 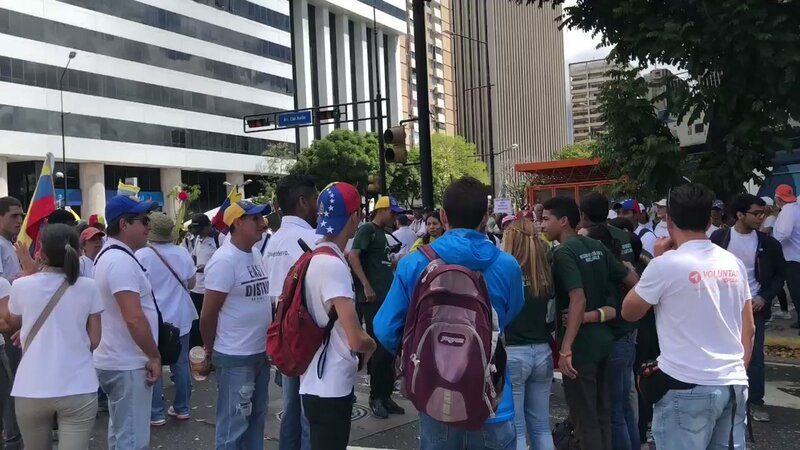 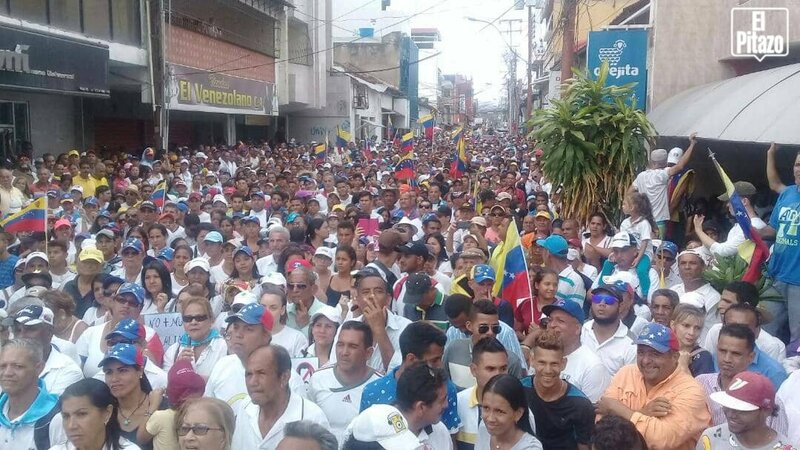 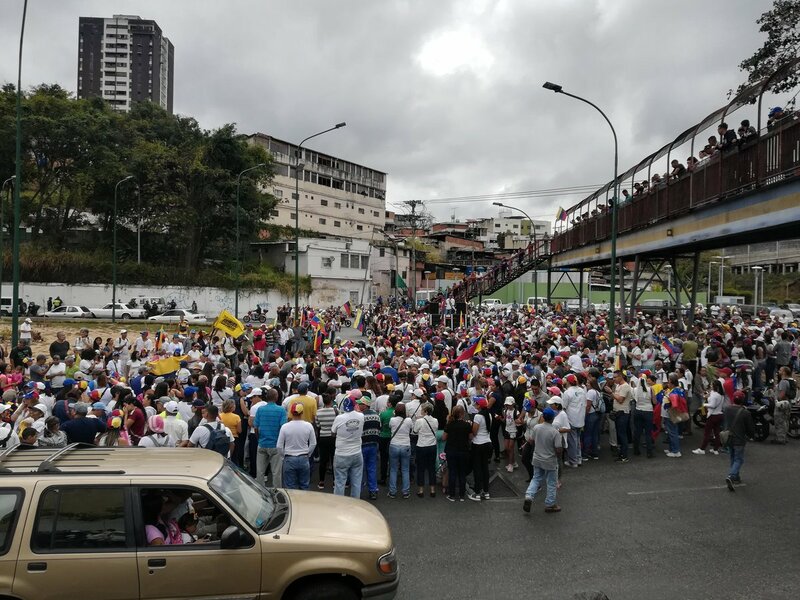 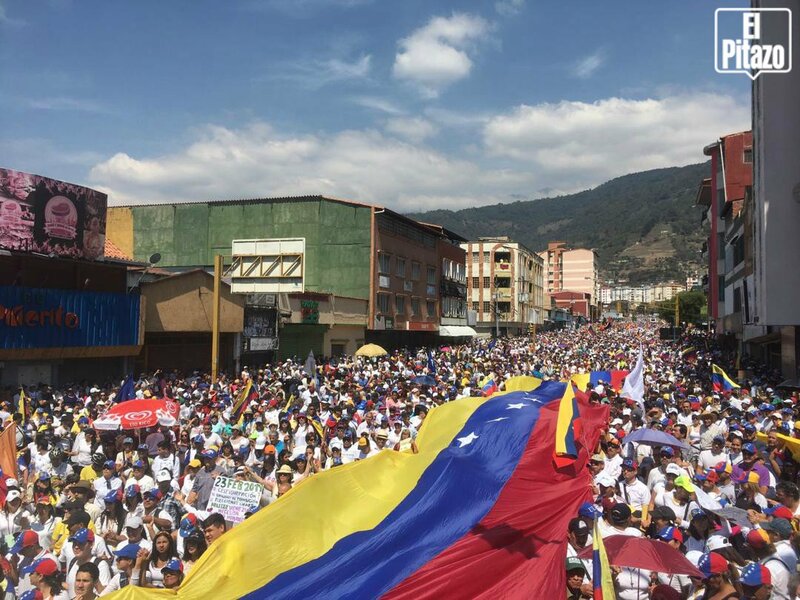 In Caracas, citizens are concentrated in Santa Fe to march in support of the entry of humanitarian aid. 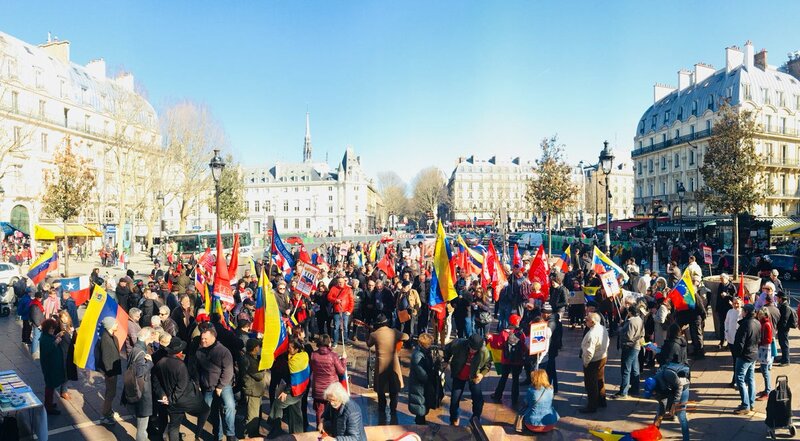 Demonstrators preparing to march in Barcelona, Edo. 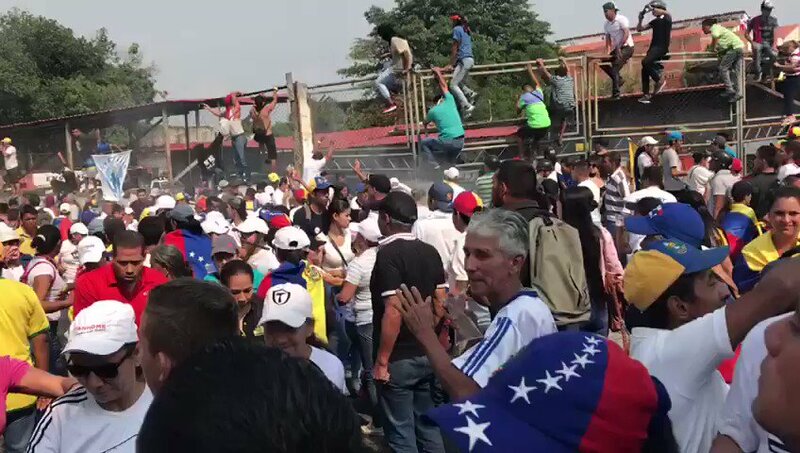 Anzoátegui. 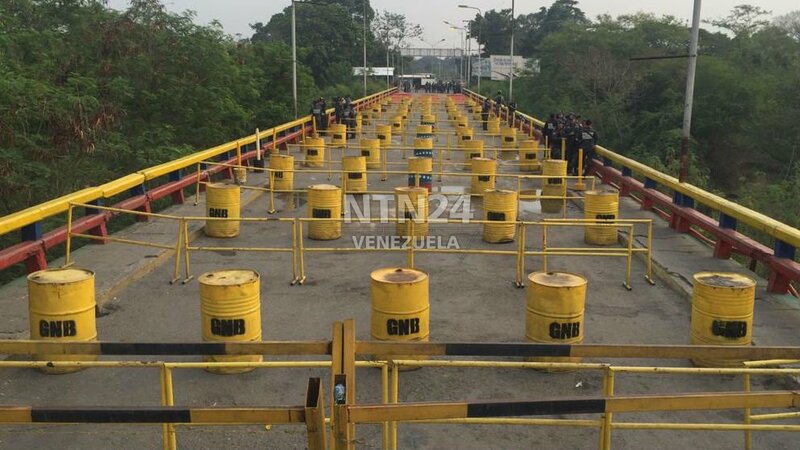 Envoy @matebe arrives at the border between Venezuela and Brazil. 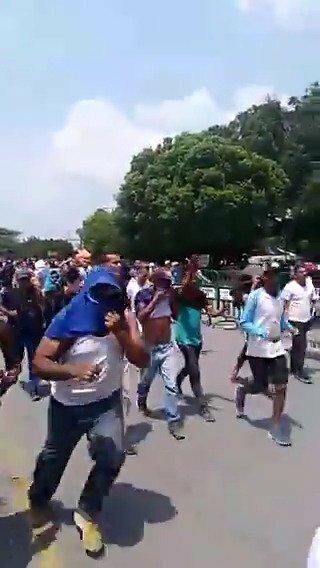 Dozens of protesters in the place. 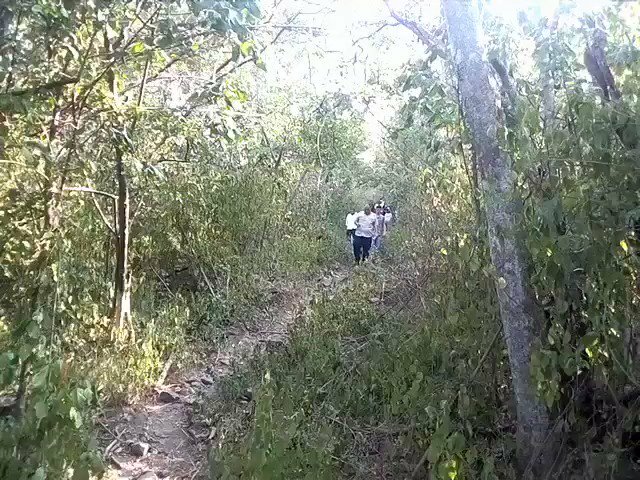 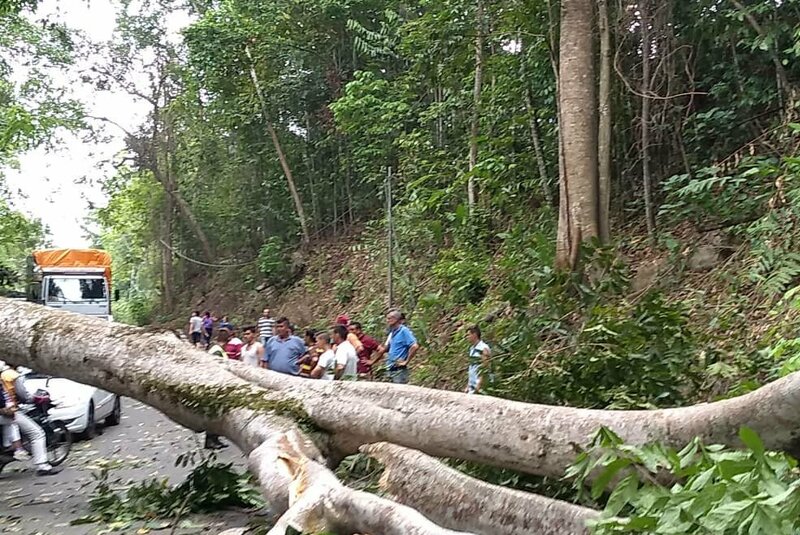 National Guard cut several large trees in Los Mirtos, on the road between El Cobre and San Cristóbal, to prevent the passage of vehicles to Cordero, Táriba and San Cristóbal. 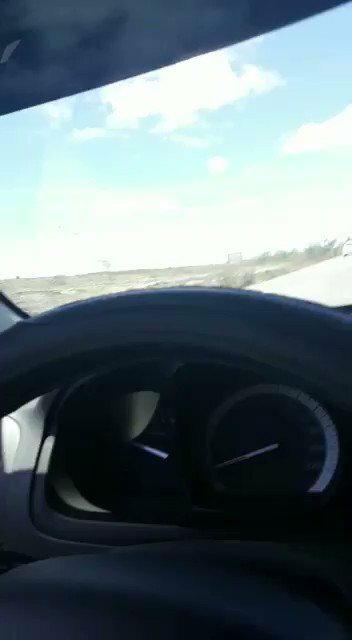 Tanktan inen askerlerin ellerinde silahlarla sınırın Kolombiya tarafına geçtikleri belirtildi. 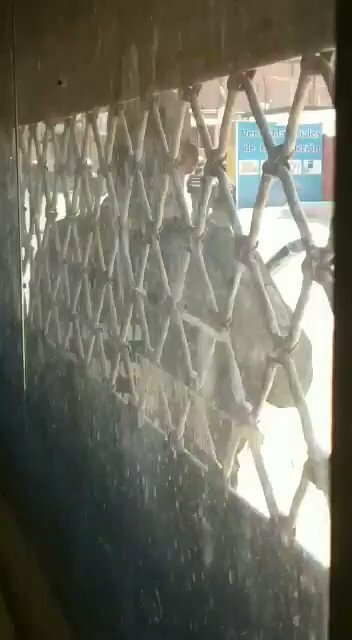 Olayda bir polis memuru ve bir fotoğrafçı yaralandı. 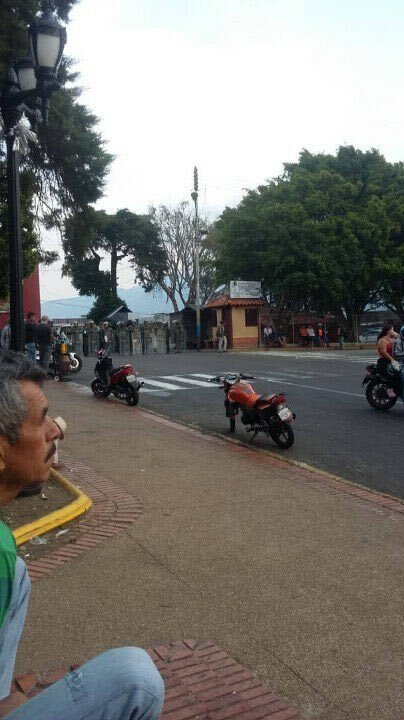 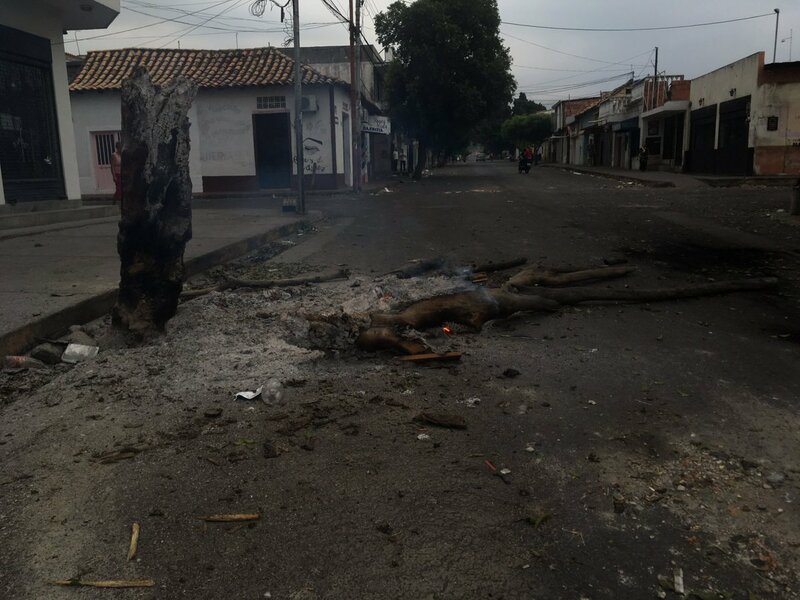 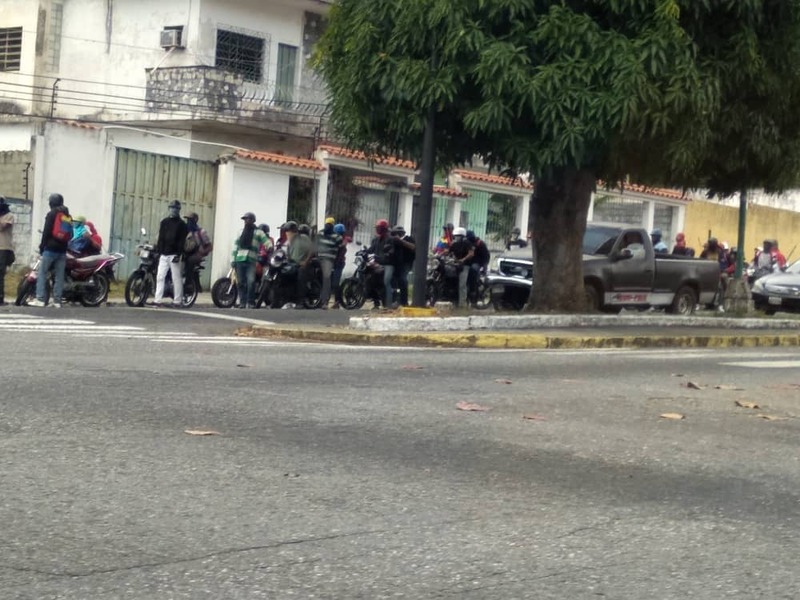 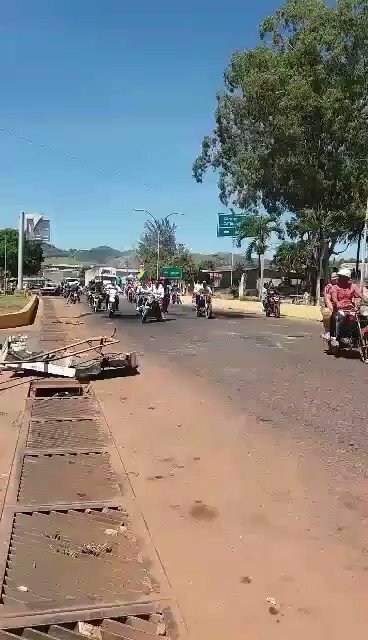 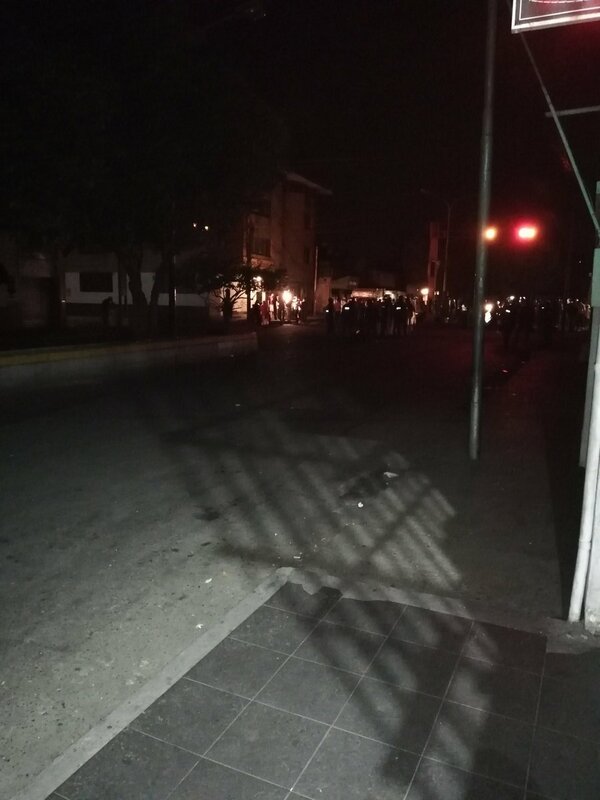 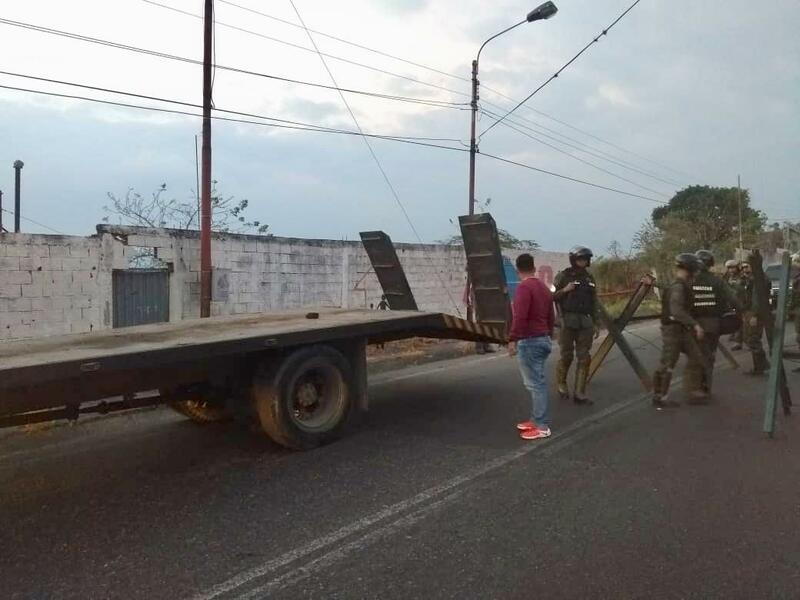 Inhabitants living in Ureña, Táchira state, removed barricades placed by National Guard officials. 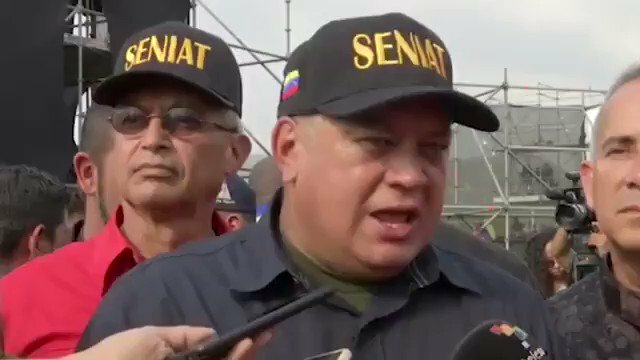 Diosdado Cabello assures that no foreign soldier is going to move to Venezuela, "whoever does it runs the risk of being answered as an invader," he said from the border with Colombia. 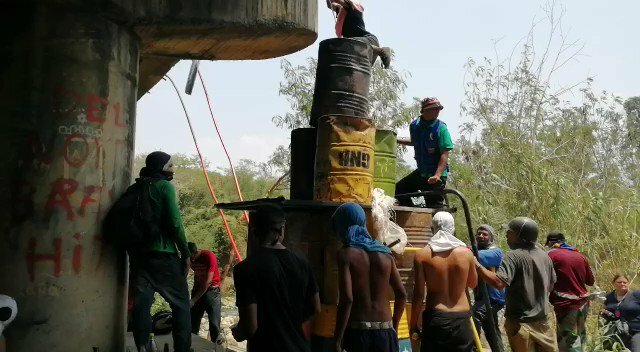 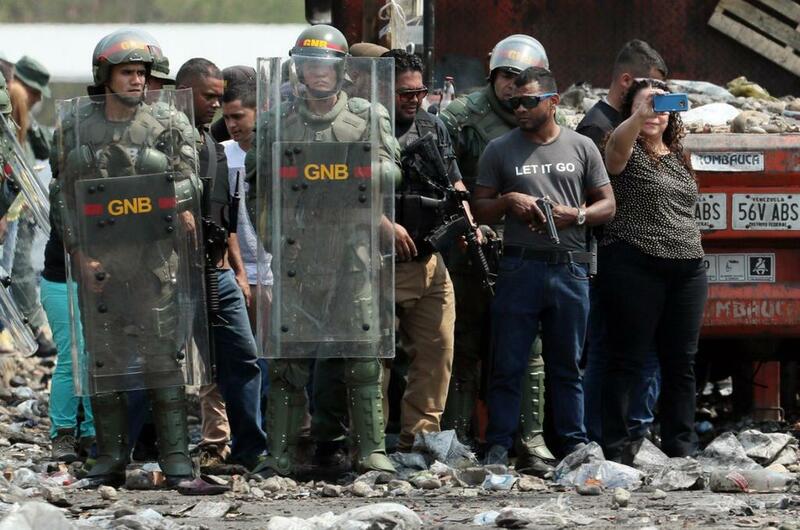 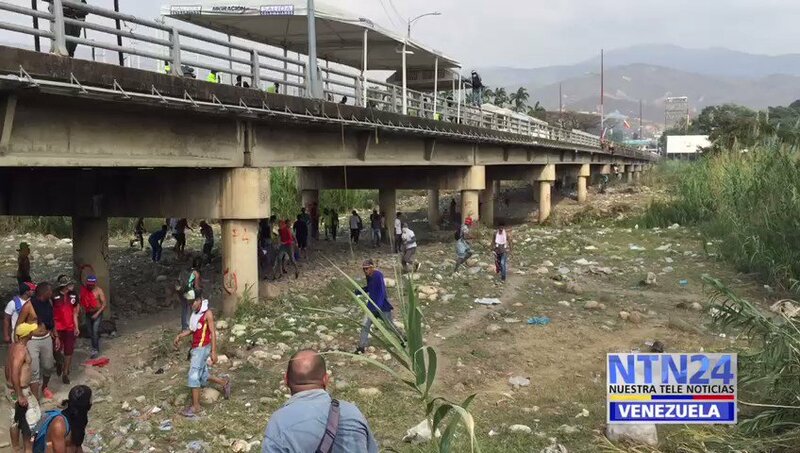 "We want freedom," say Venezuelans who remove barriers to open the way to Venezuela at the Simón Bolívar International Bridge. 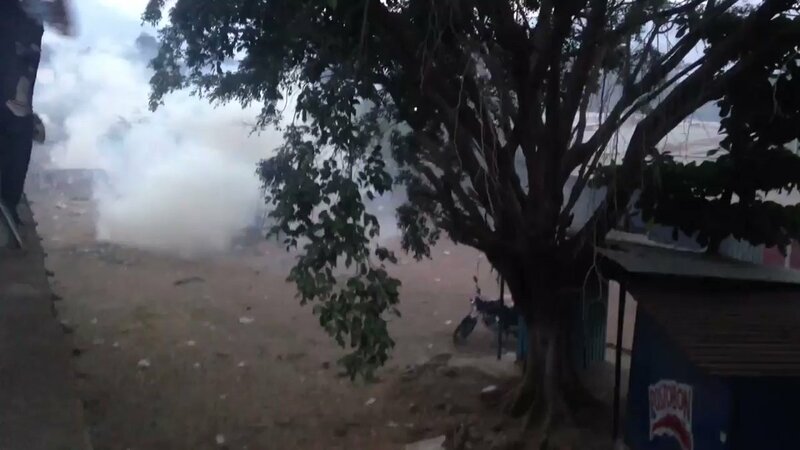 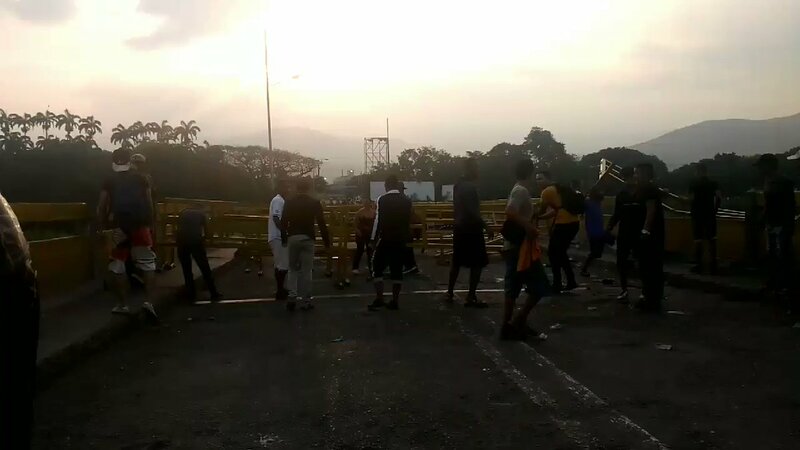 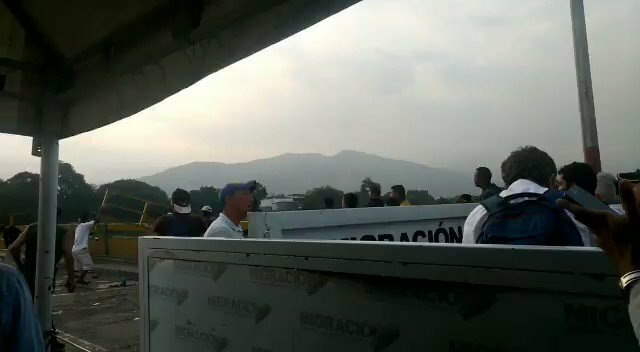 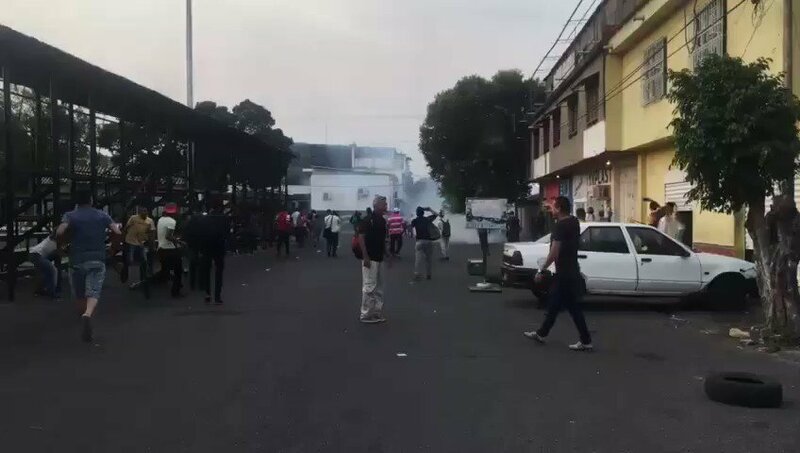 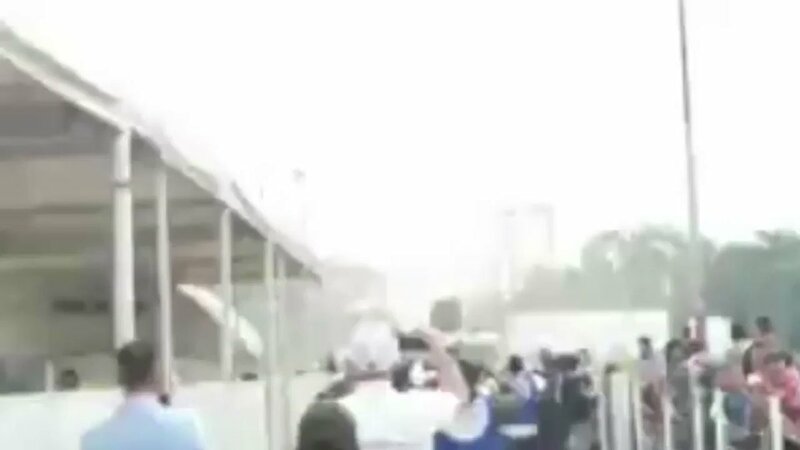 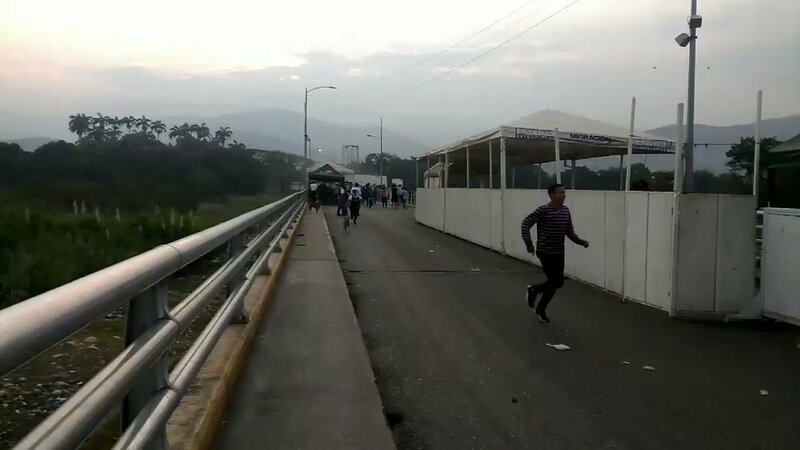 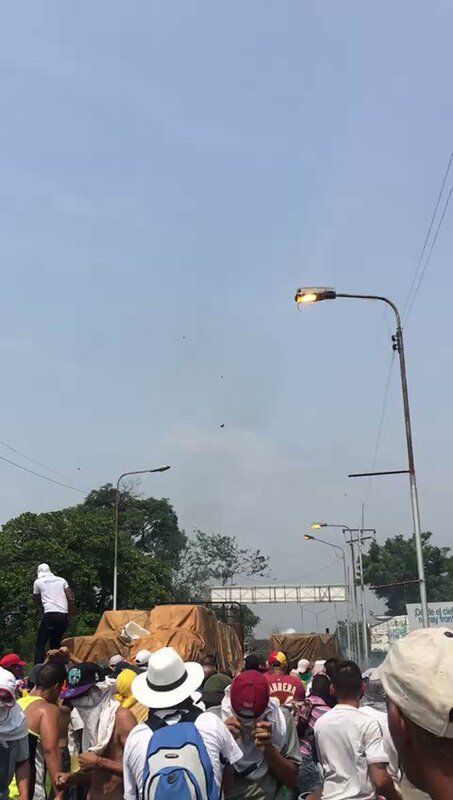 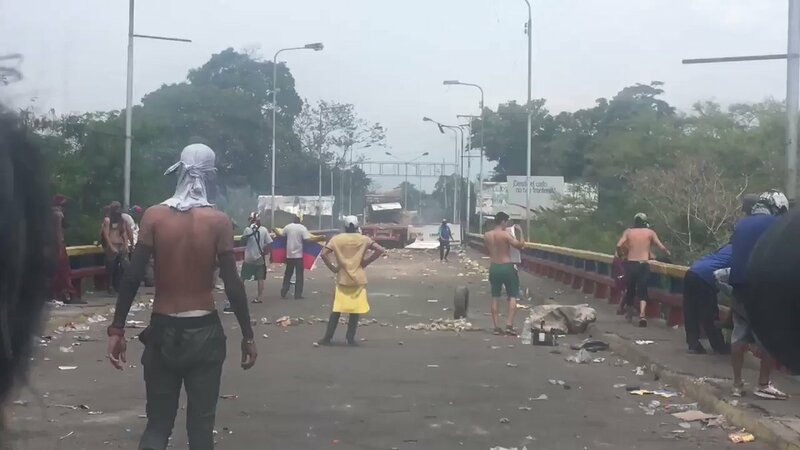 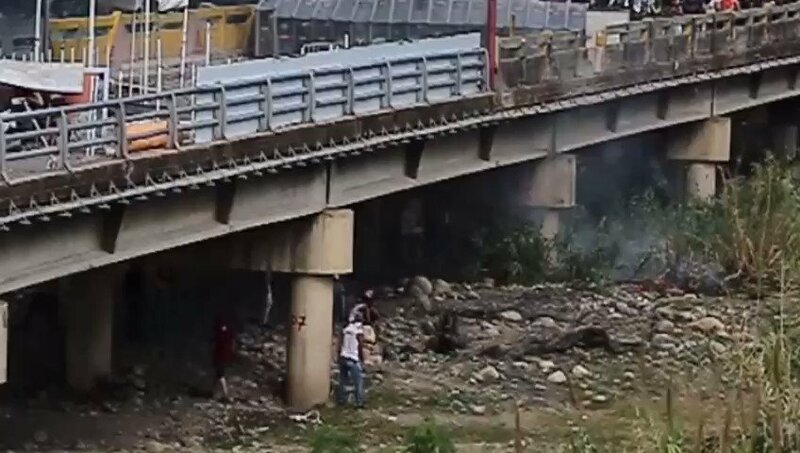 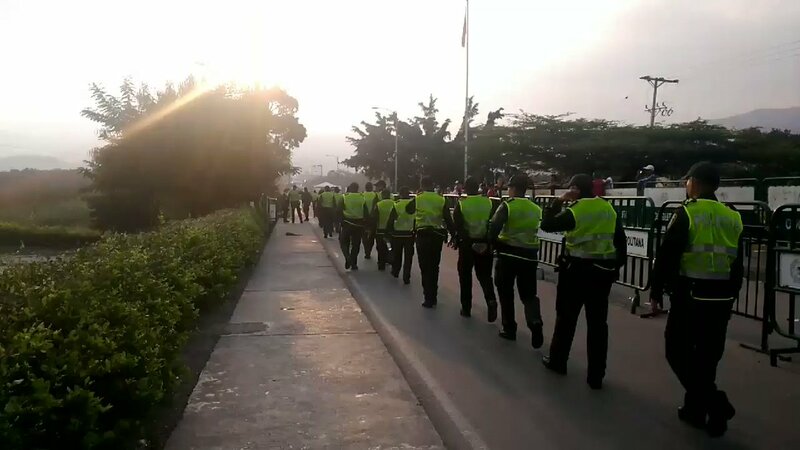 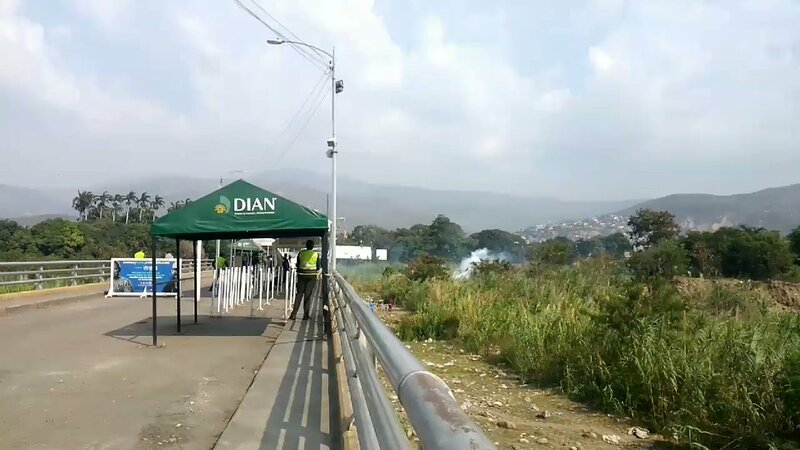 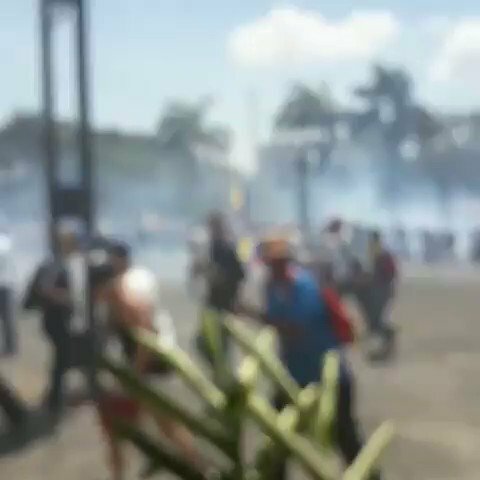 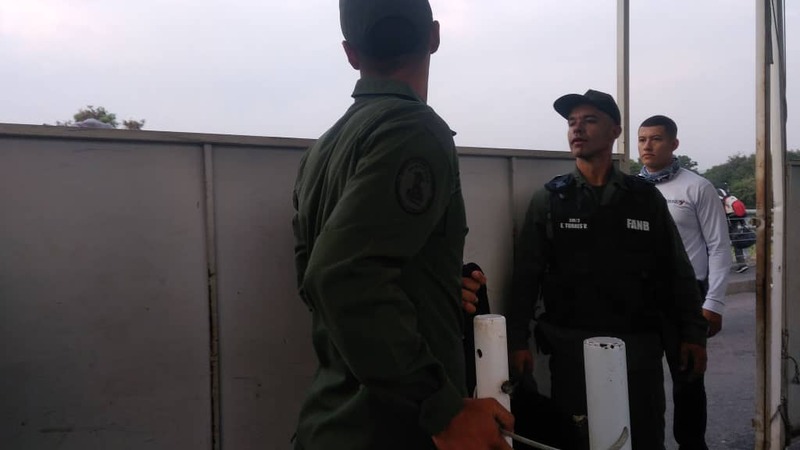 Tachira: In Ureña, GNB troops are throwing tear gas at the people, demanding the pass through Francisco de Paula Santander international bridge linking with Colombia. 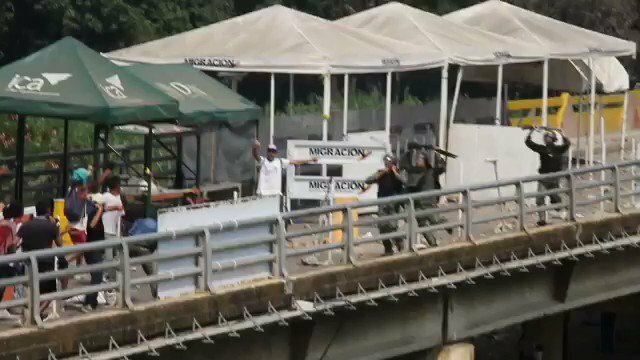 Colombian Police advances towards the Simón Bolívar International Bridge. 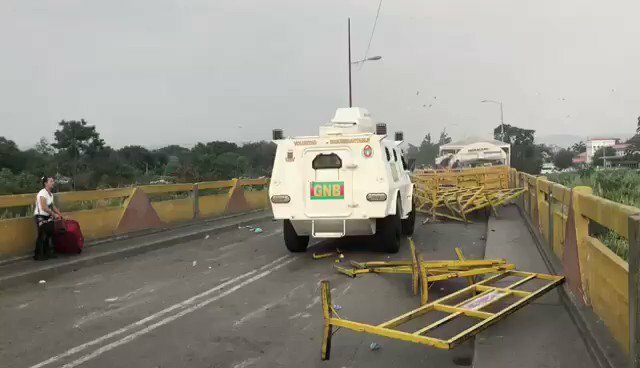 Two military vehicles on the side of Venezuela knocked down the structures that closing passage to Colombia. 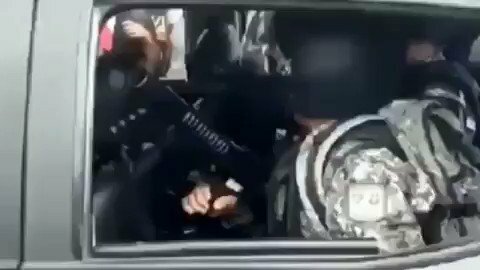 There is a wounded woman. 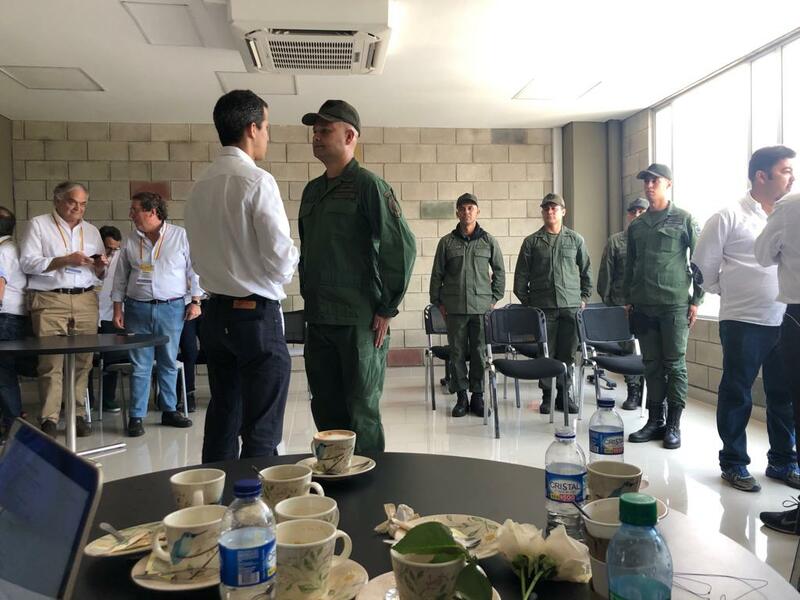 Two soldiers from the FANB went to Colombia and met with MP Olivares. 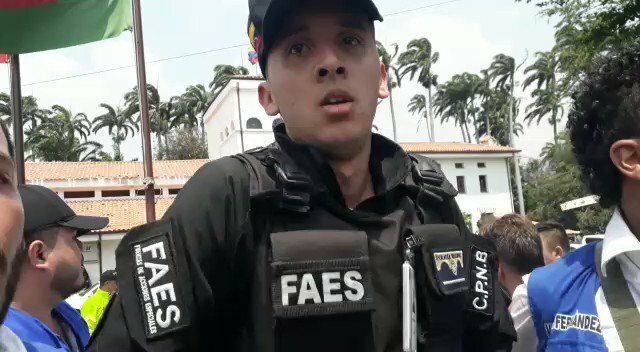 One of the military is wounded in the face. 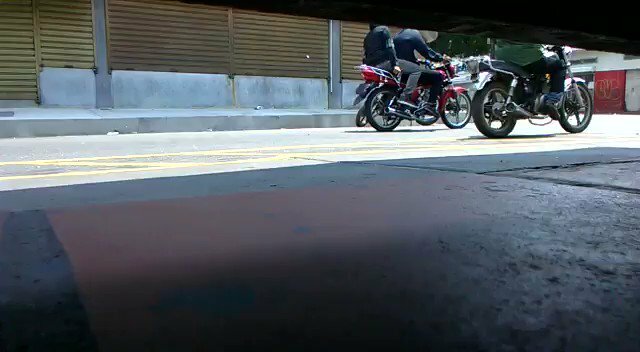 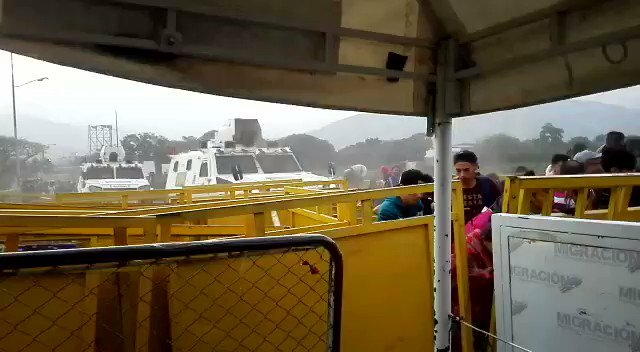 Bus with MPs, activists and journalists was robbed by armed people in Tachira 2:35 am, were stripped of their belongings. 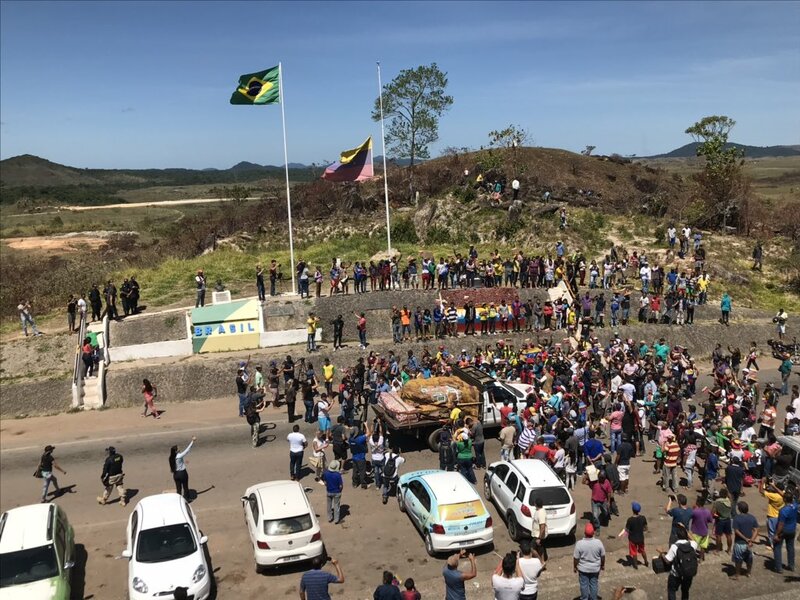 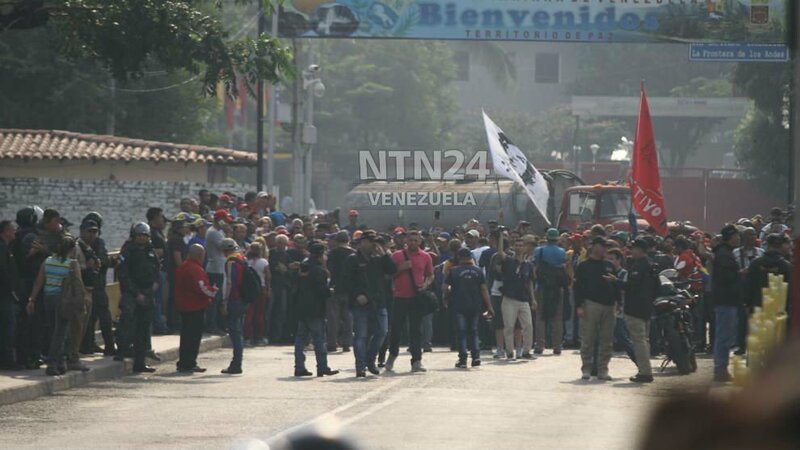 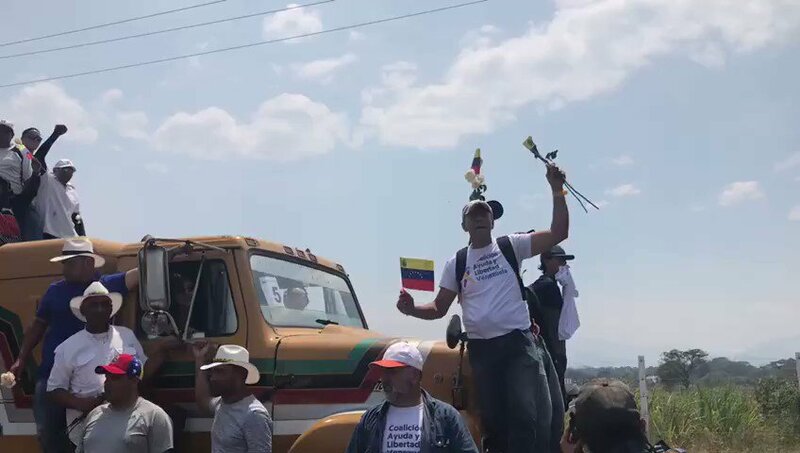 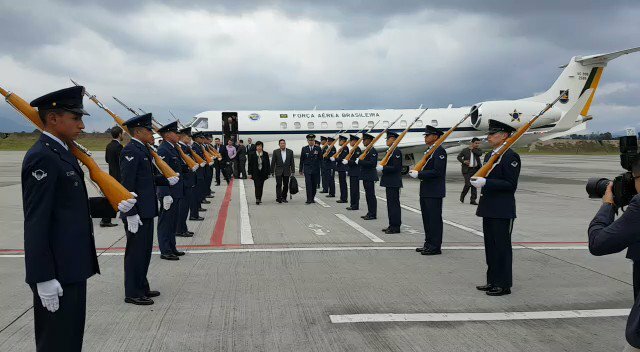 Táchira Thus was received the last caravan of deputies who arrived in Táchira state on the night of this Friday, February 22, after traveling 35 hours by road, from Caracas. 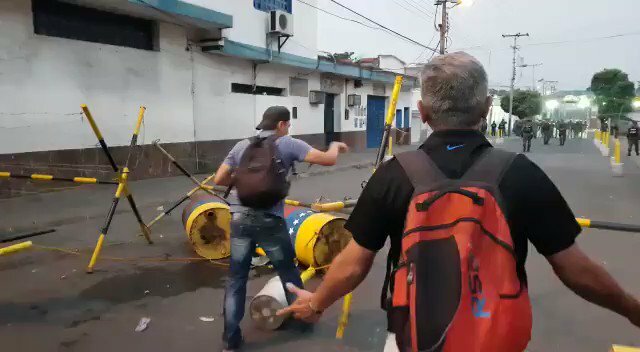 The criminals who carried long weapons, not only robbed the deputies and VPITV reporter team, but also belongings of the people who passed through the area. 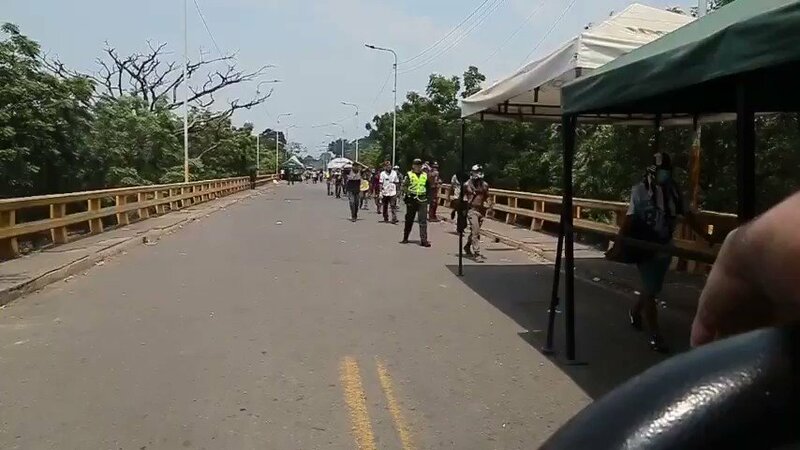 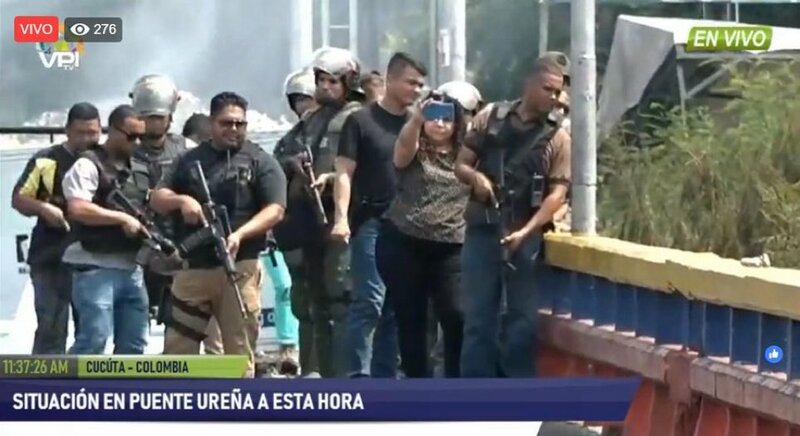 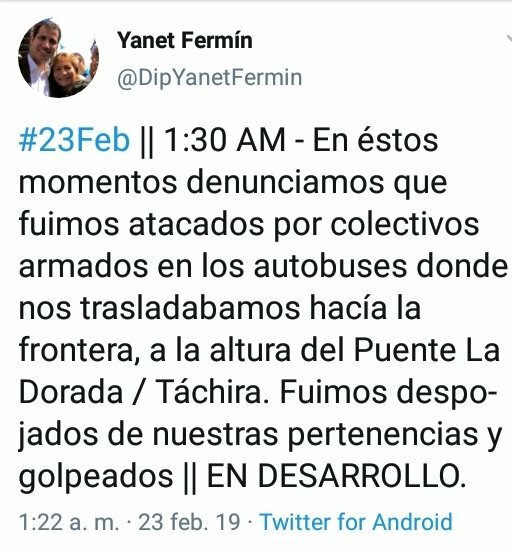 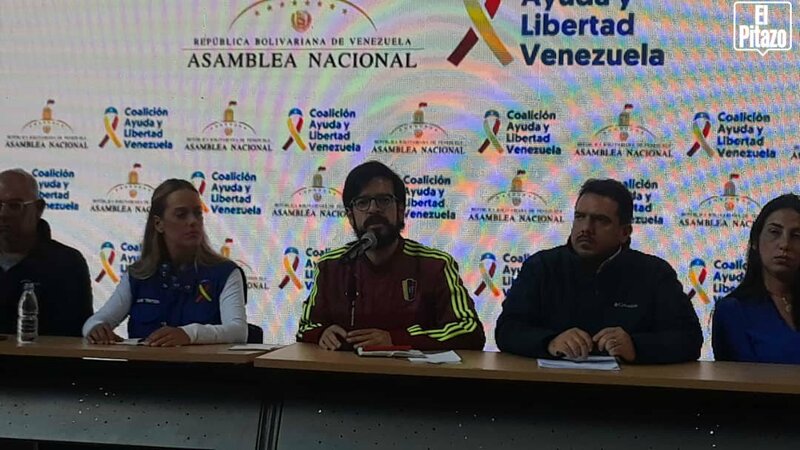 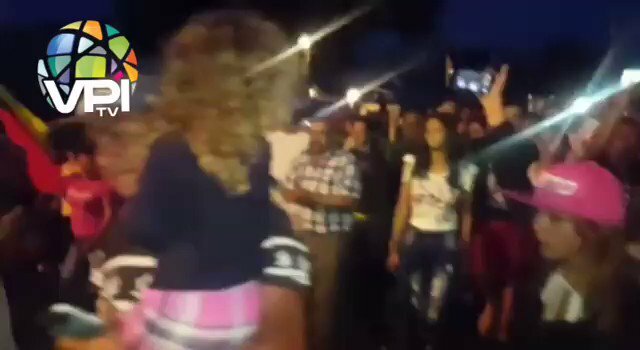 Táchira: The deputy Yanet Fermín, @DipYanetFermin, reported that they were attacked by colectivos, at the height of the La Dorada bridge.